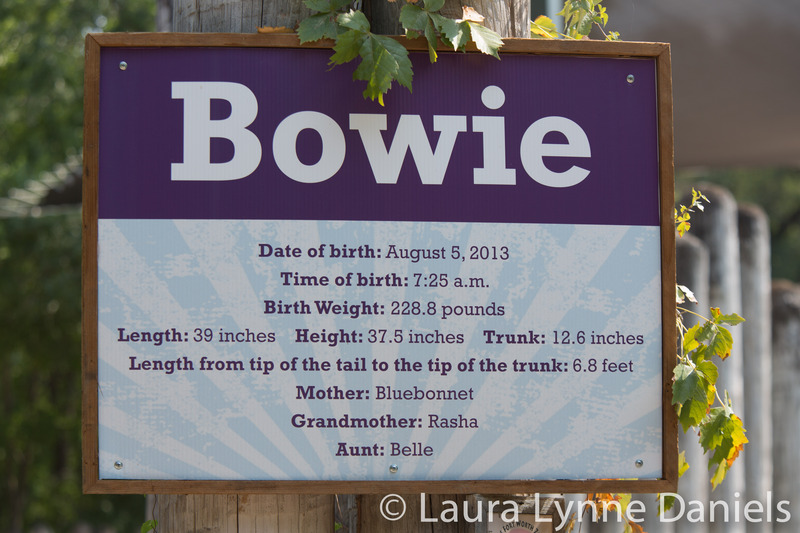 I Was So Sure That Today Would Be Bowie’s Day…. 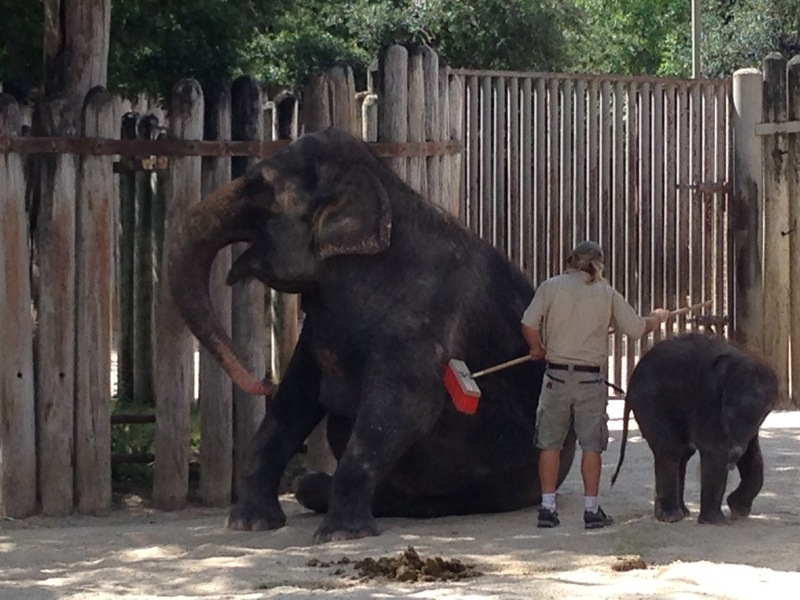 But no Bowie… I got to the elephants this morning before they were out. 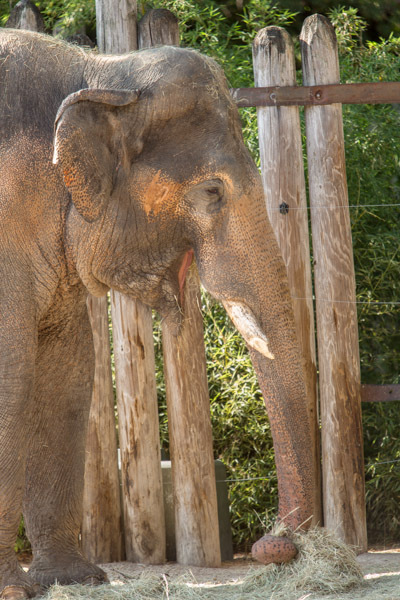 Kami or Kelly weren’t there, but Mike was (today was my first time talking with Mike, but Kami introduced me to him yesterday). 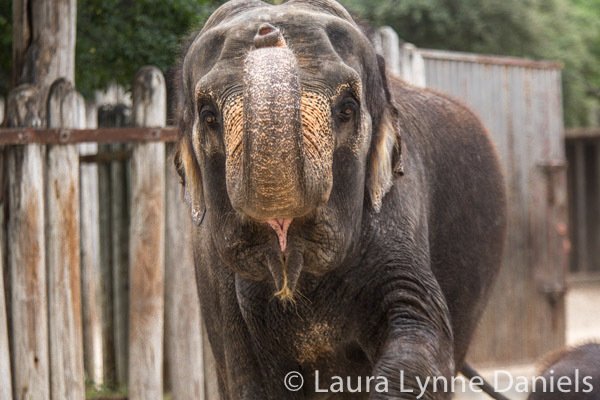 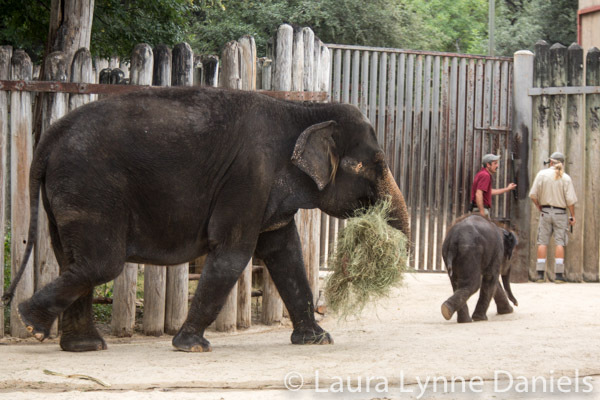 We were waiting for the elephants to come out, then the Zookeepers came out to make sure the food was in the right place and that everything was set for them, then about 5 mins later the gates opened and out came Rasha and Belle… but oh, what an entrance! 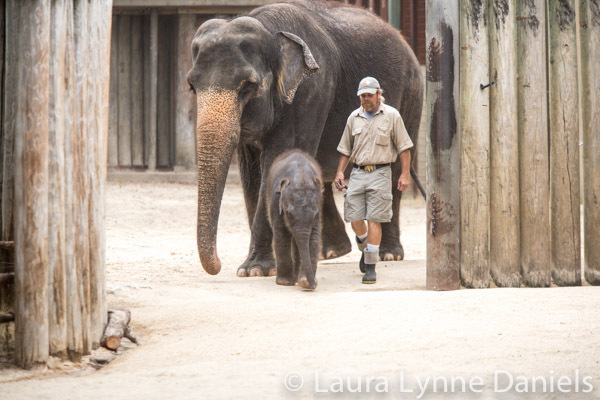 Today Rasha, the zookeepers and Belle following, walked straight out to the visitors and Rasha smiled and gave a big Hi-5 to us! 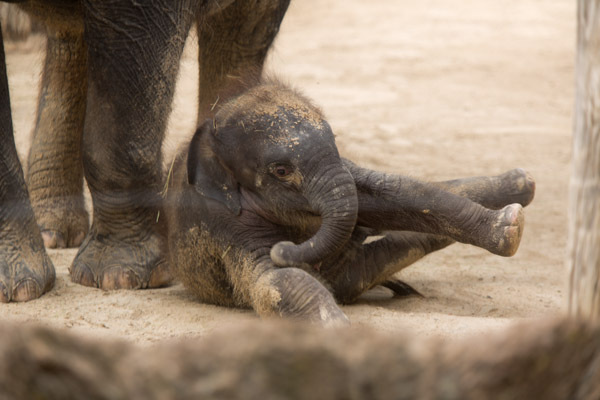 It was very cute, and of course I got it with my camera. 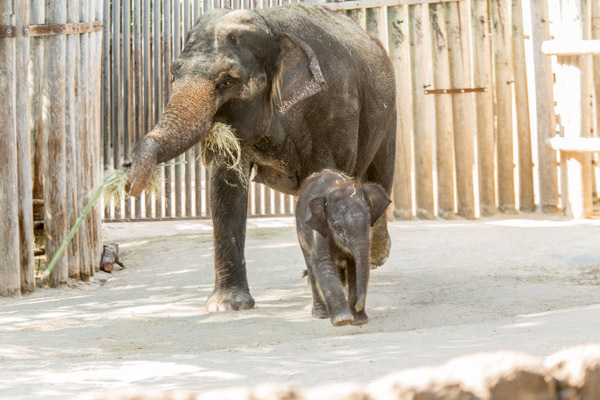 Then Rasha and Belle went over to their hay, Rasha grabbed a big bunch with her trunk and she took it where she could eat with a little more privacy. 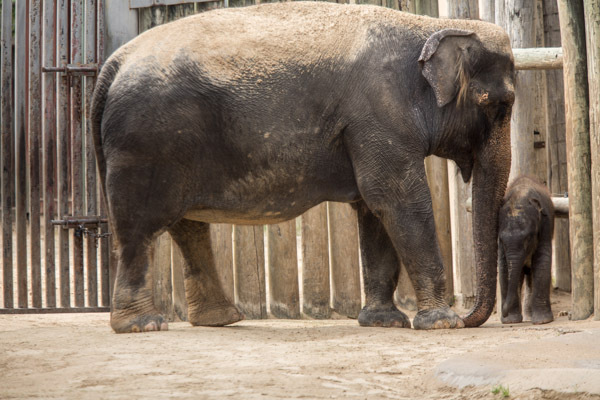 I found out today that Belle is already about 470 lbs… she’s on the big side. 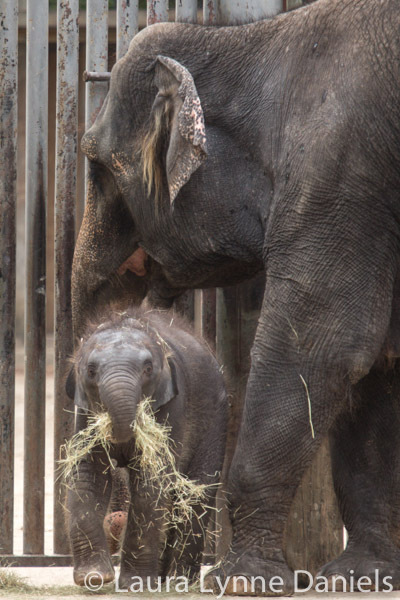 Belle was lively today, she did a little bit of running, today was her first day of trying to eat some hay (at least it was the first I’ve seen it and Mike said the same thing)… she grabbed a big bunch of it with her trunk, but I think more fell on the ground than actually went in her mouth and she was trying to dig a hole and play and eat some mud. 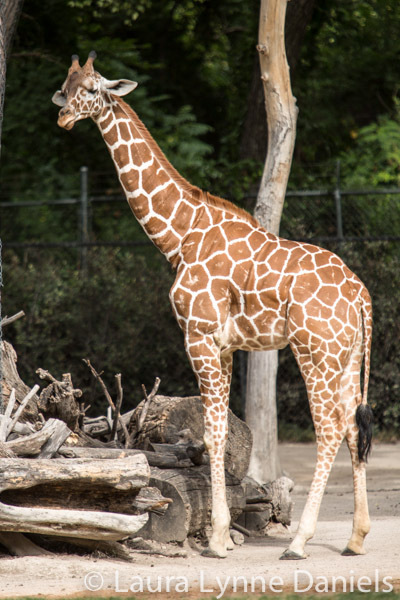 I also found out today that there is a one year old giraffe, her (I think it’s a her) name is Tatu. 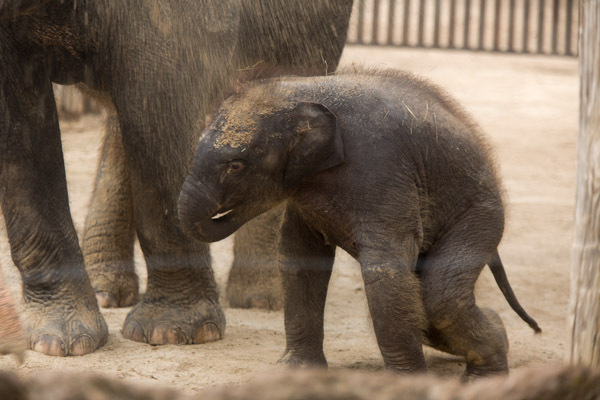 She is smaller than the adults, but unilike the elephants and Greater One Horned Rhino’s, giraffes grow tall quickly. 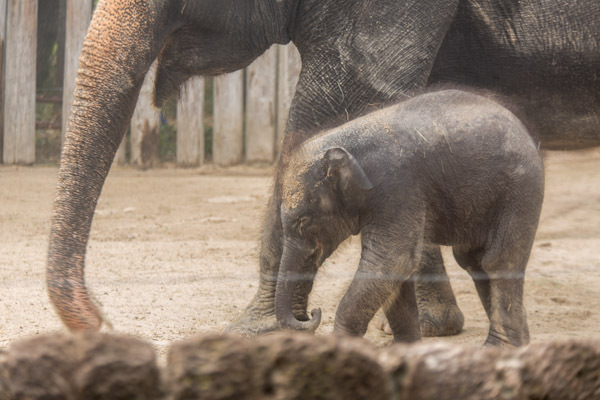 She’s already 10′ tall. 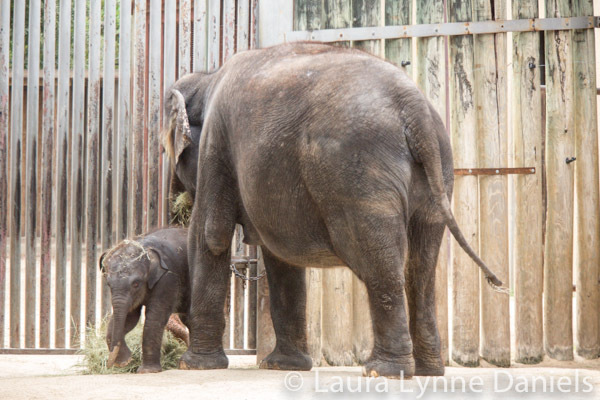 Click here for more information about Tatu’s birth. 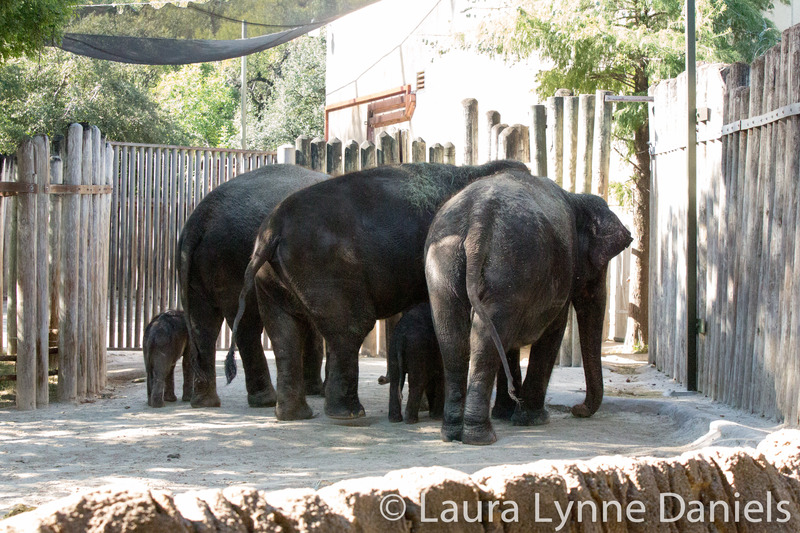 Today I went to the zoo with the thought that today will be the day that Bowie comes out… well, not today. 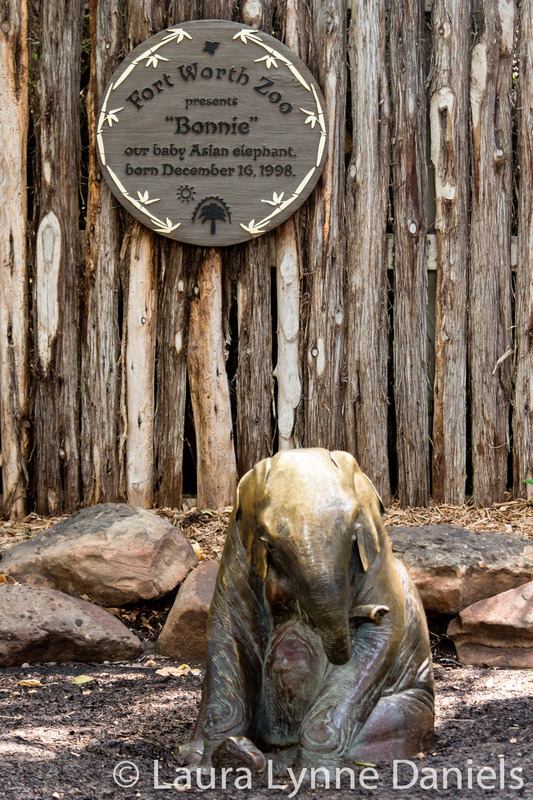 I see now that they post it at the entrance whether or not Bowie (or another animals) will be out for public viewing. 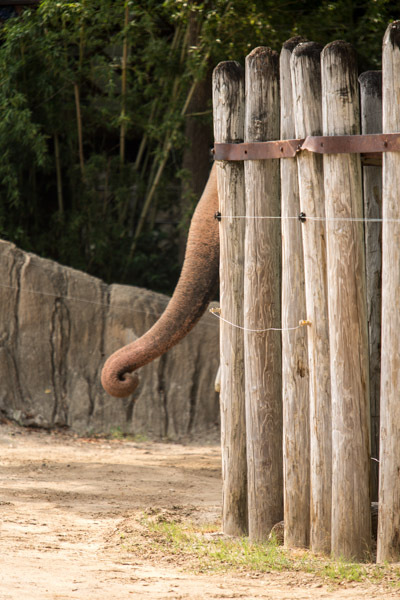 I’ve never noticed that before, but I am sure it’s been there every day. 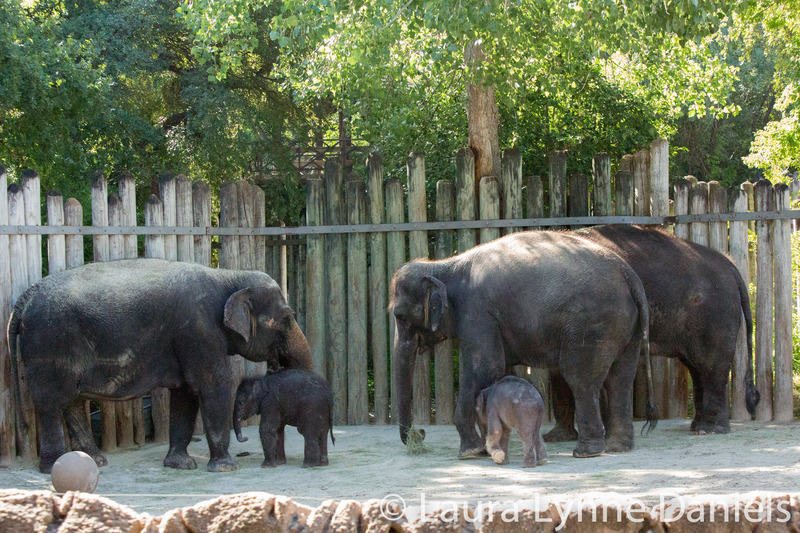 I got to the elephants and Kami (my new zoo friend!) 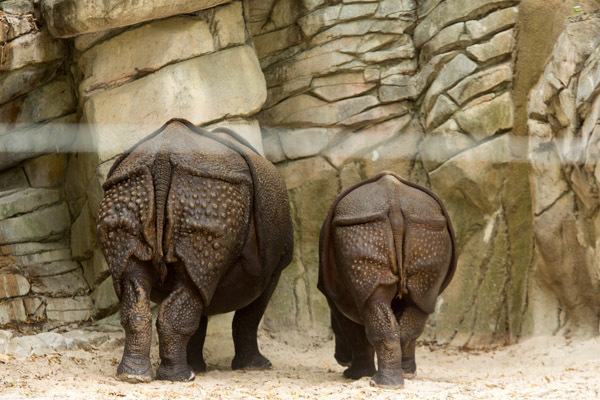 was there. 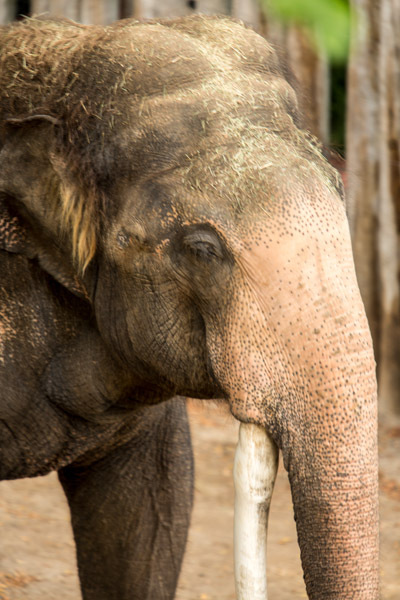 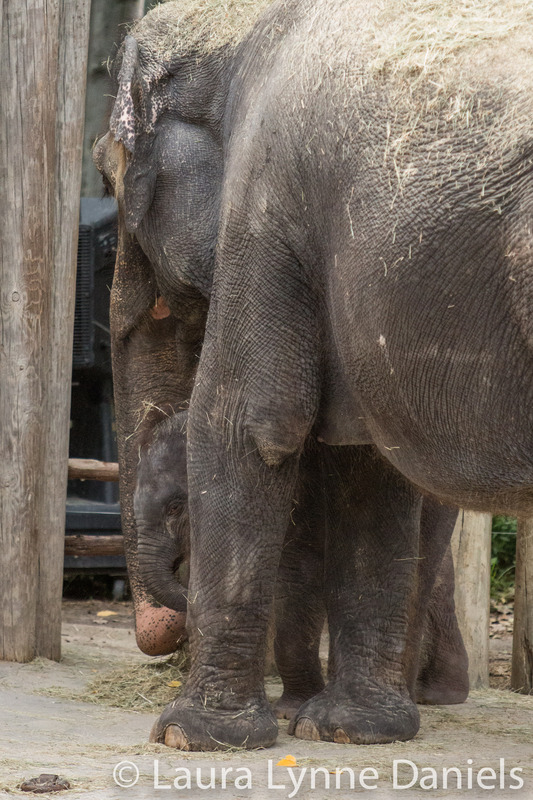 I was taking photos of Belle and Rasha, and a nice lady asked me if I wanted for her to take photos of me while I was photographing the elephants … that was so nice of her! 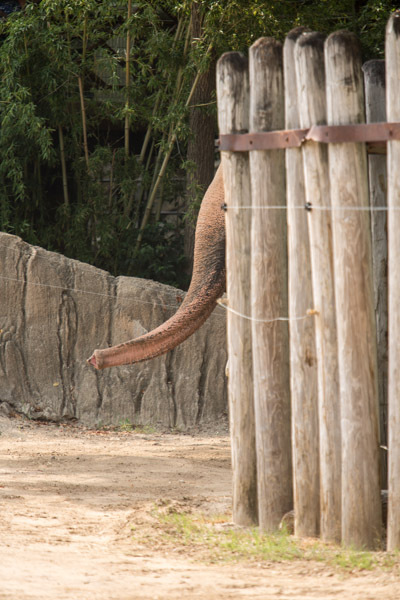 Then I asked Kami to join me in one of the photos…. 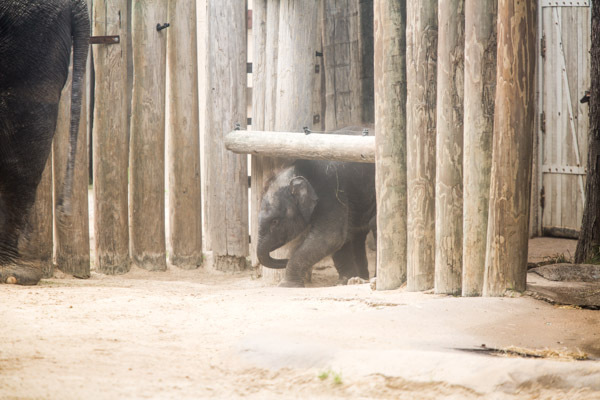 I found out today that Bowie was out for public viewing the first week that he was announced. 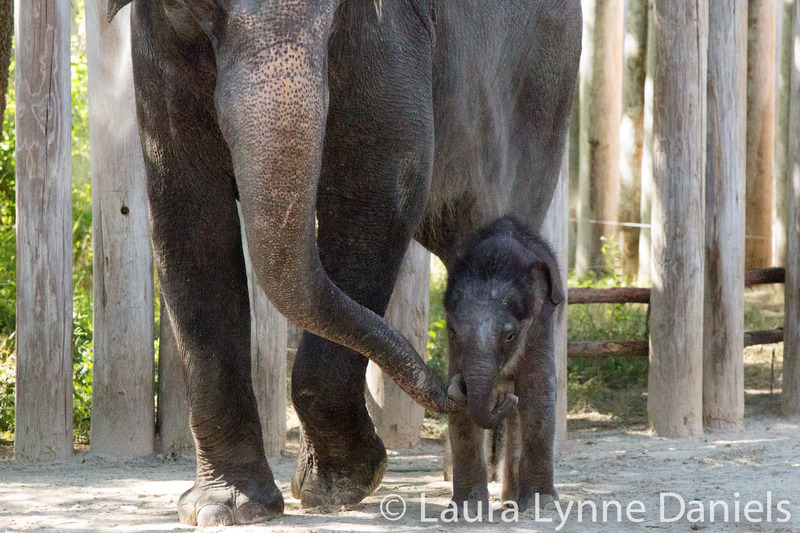 I knew about it but thought that I could wait a week or so to go and see him because I was busy and couldn’t get there… well, little did I know that they would decide that the new baby needed some extra special bonding time with his mom. 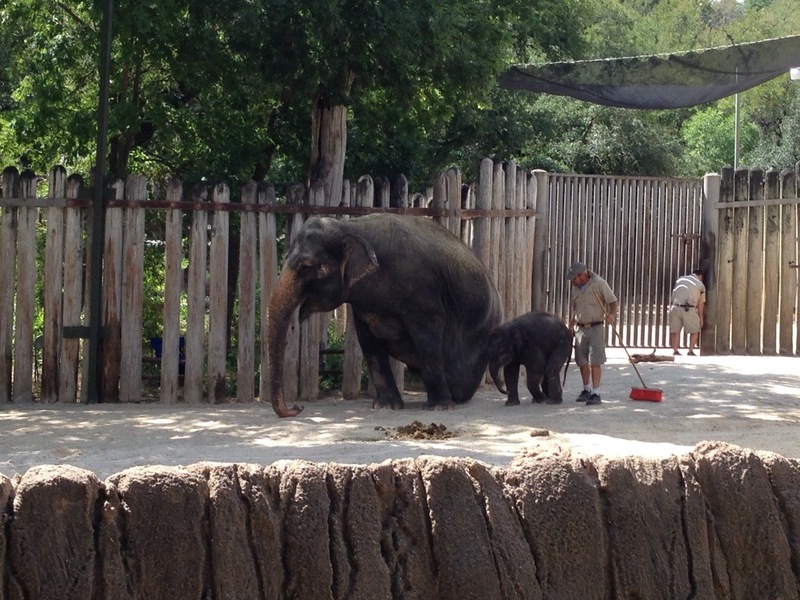 It’s ok though, I’m really happy that the zoo puts the animals well being first, rather than worrying about the public. 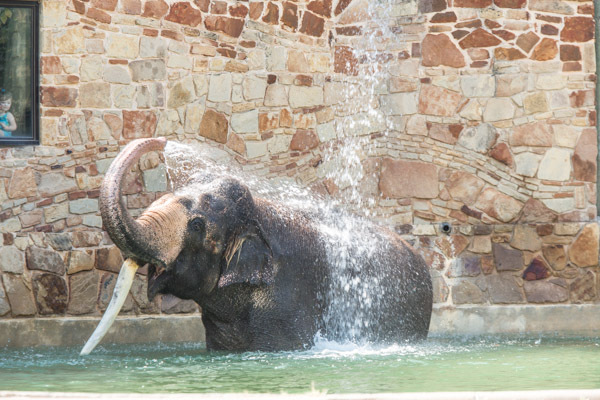 The public can wait, Bowie and Bluebonnet need their time together. 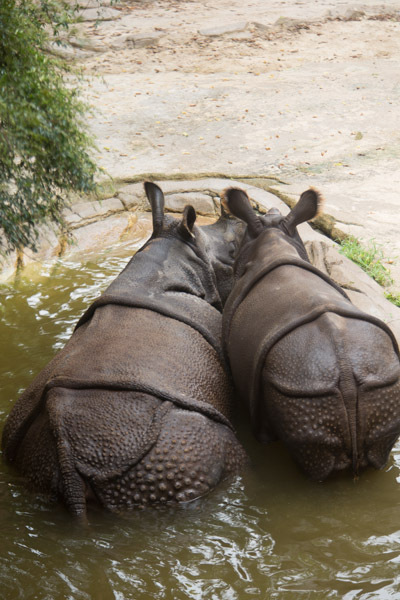 There is nothing wrong with him, they both just need a little extra time together. 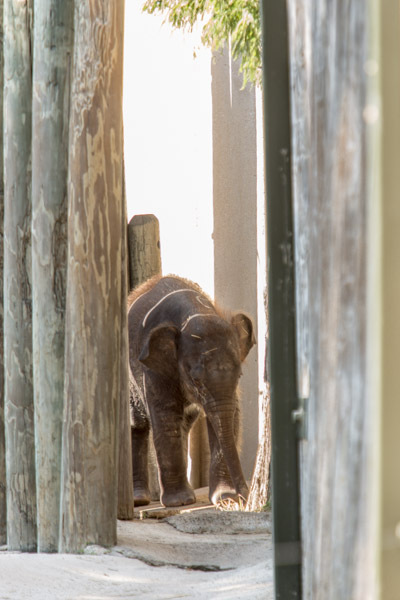 I’ll go every day (as long as I am able to) because I want to be there the first day that he comes out…. 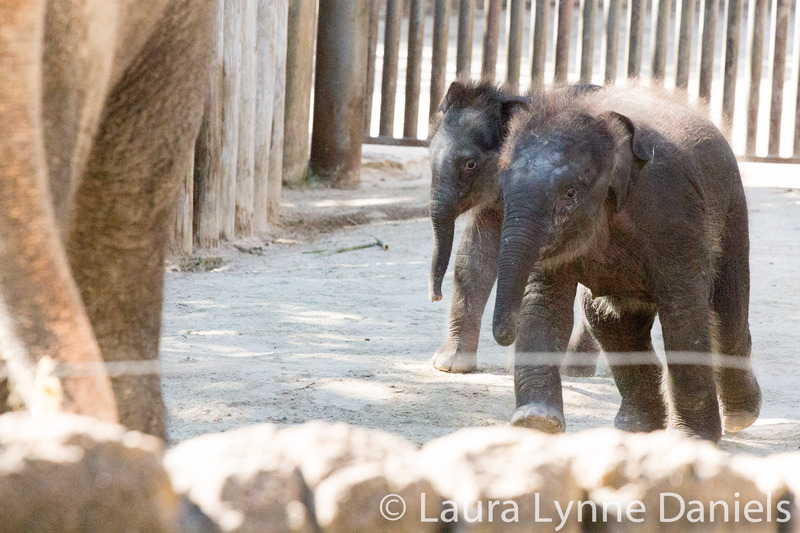 and then I can slow it down to every other day or so, just to check up on them and track their progress. 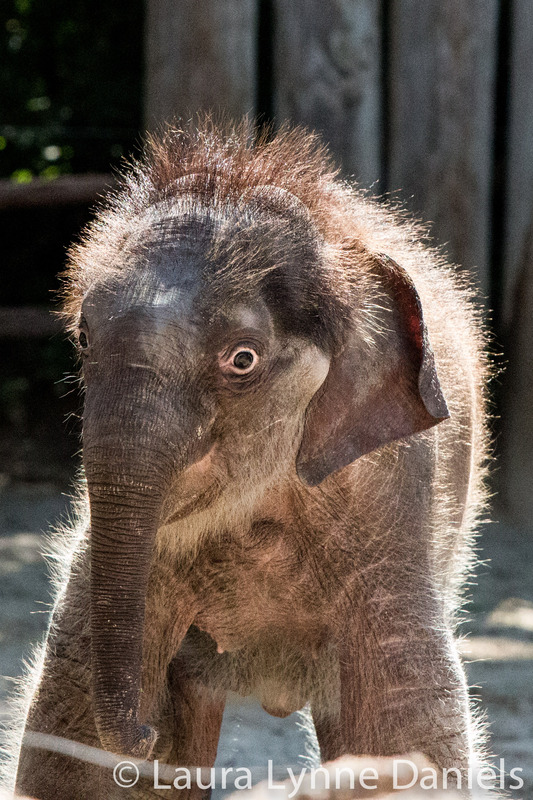 Belle is growing up and she plays a little more now. 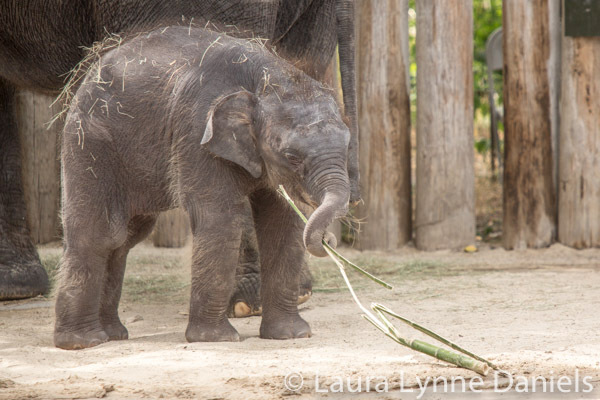 She was playing with a bamboo stick today. 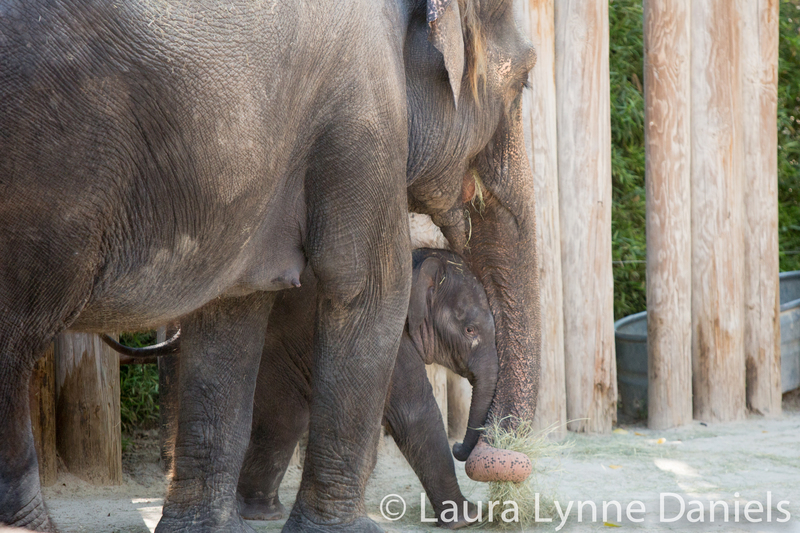 When Rasha goes towards the back of the pen, Belle likes to go into a little cubby sort of area and play… she never ventures far from mom, but she is moving a little further away than when I first started visiting with them. 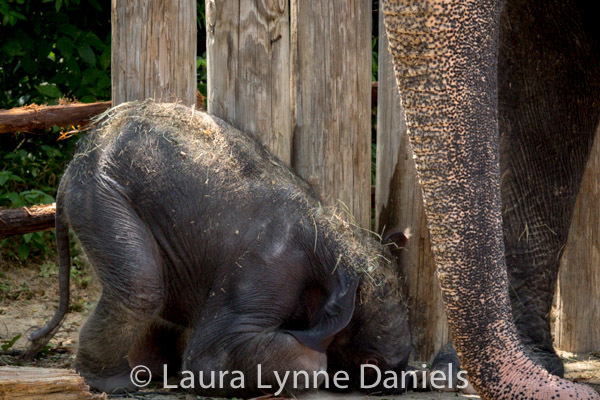 I found out today that Kami’s husband does wildlife photography and she showed me some of his work, it’s beautiful! 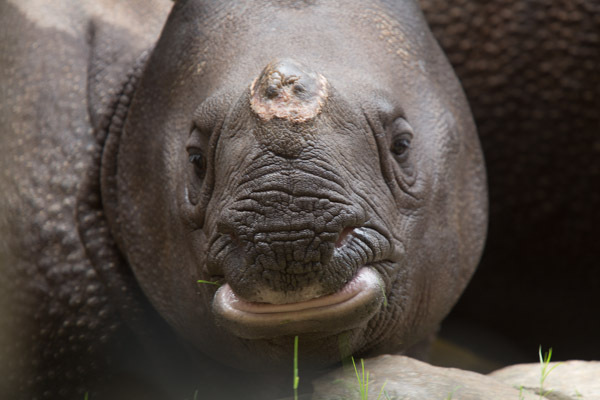 I met the other specialist today, Mike, this is the first I’ve met him, but I’m sure I’ll see him along the way.. It’s nice to go there and know people. 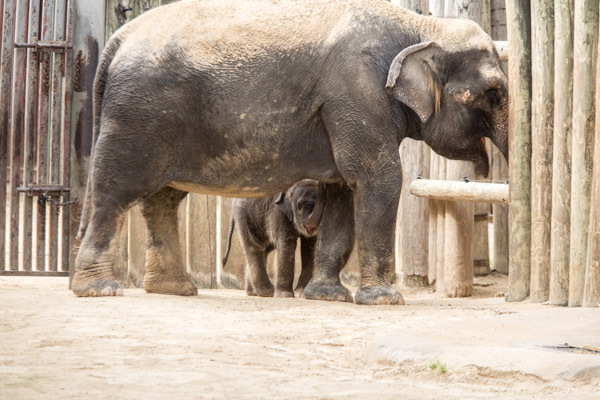 I love seeing the little kids and their mom’s and dad’s when they see the baby elephant for the first time, they get so excited… sometimes I think that the parents get even more excite than the children! 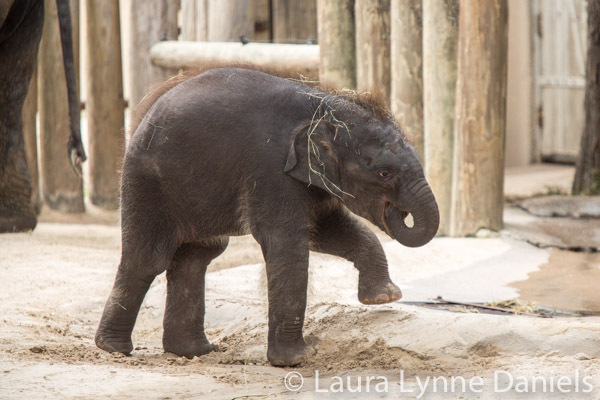 It’s fun to watch Belle grow and take new steps along the way… she’s learning to pick things up… she’s a little clumsy at it, but she’s getting there. 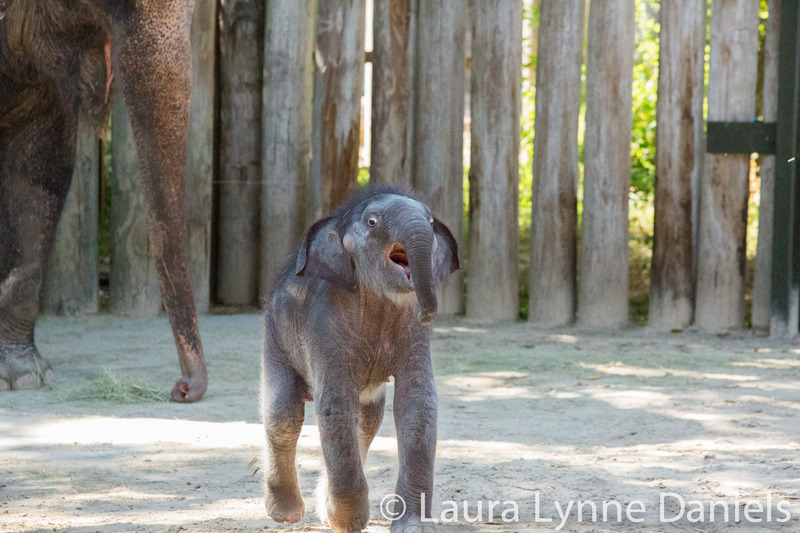 She runs a little bit more than she used to, and this is just so cute! 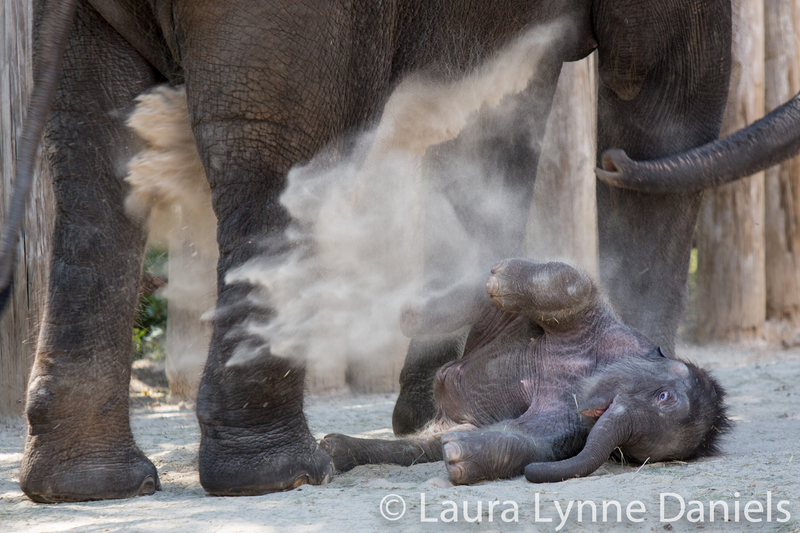 Rasha is always throwing dust on herself. 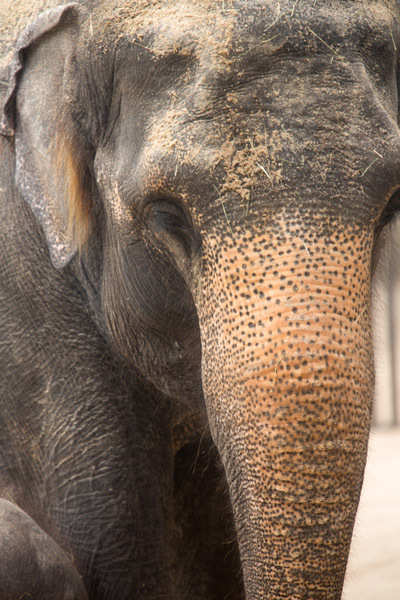 Elephants dust themselves to remove and protect them from insects and to protect their skin from the sun. 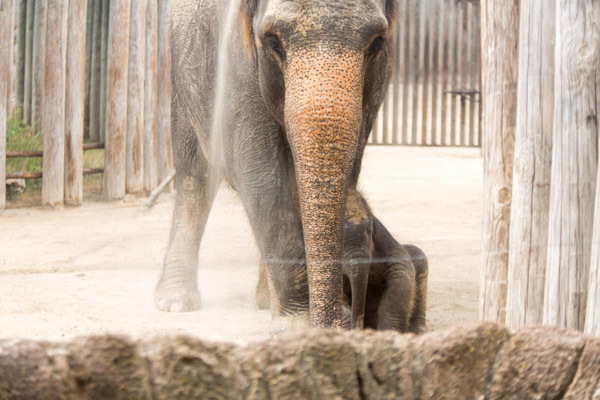 Belle hasn’t really figured this out yet, but Rasha’s dust also covers Belle. 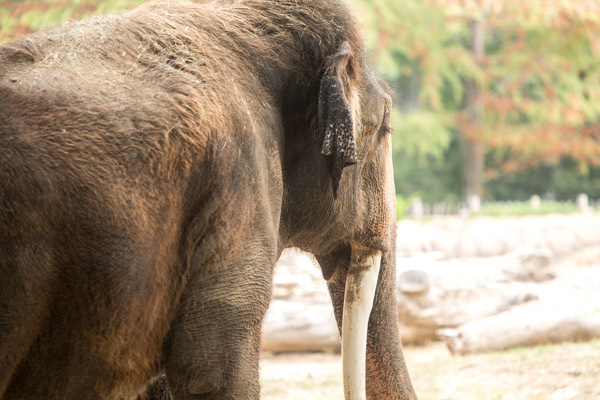 Kami and Kelly (the Fort Worth Zoo Interpretive Specialists) are full of so much information about the elephants and also the other animals. 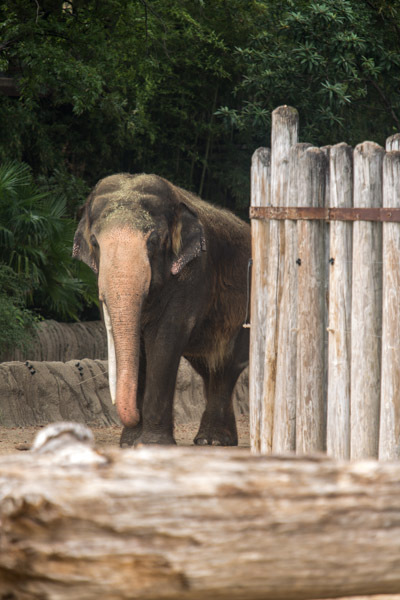 I haven’t met the Zoo Keeper yet, I haven’t been there at the right time to talk with them, but I think they do come out at certain times to talk with everyone about the different animals. 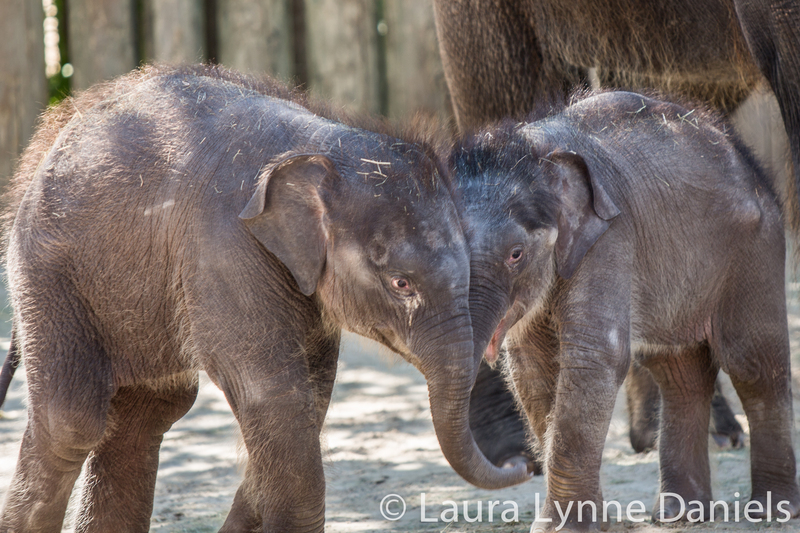 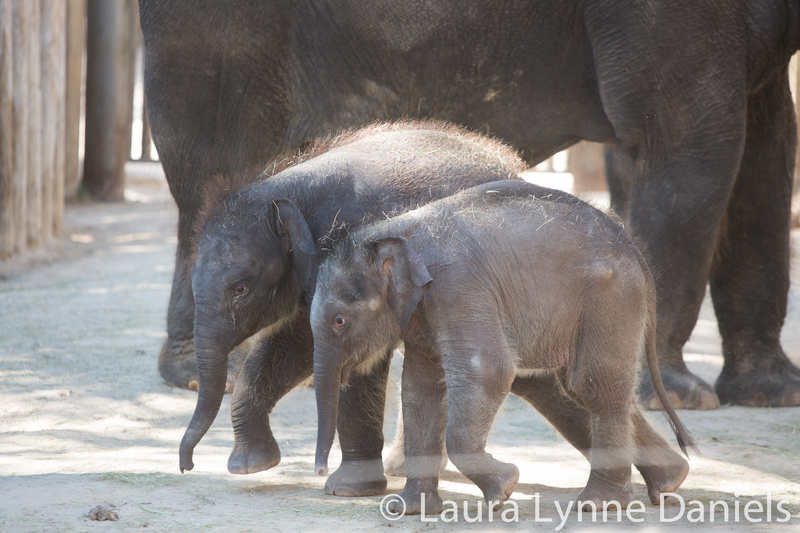 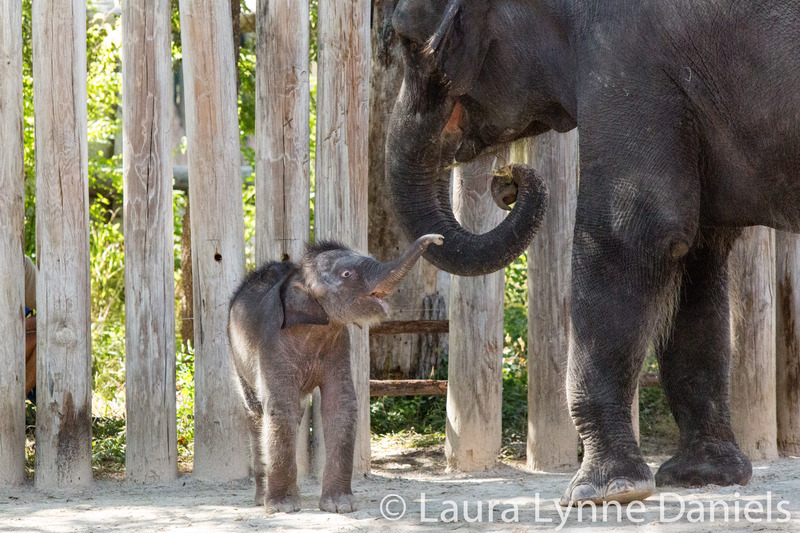 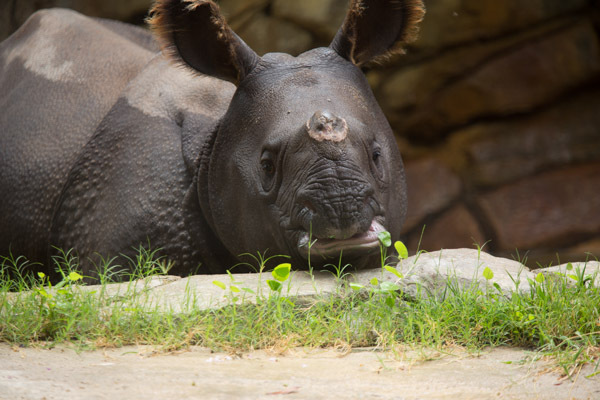 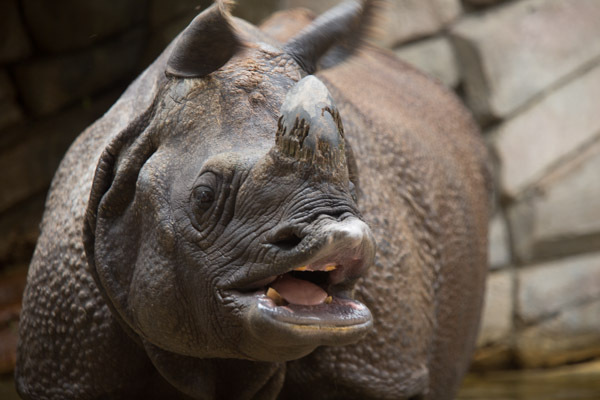 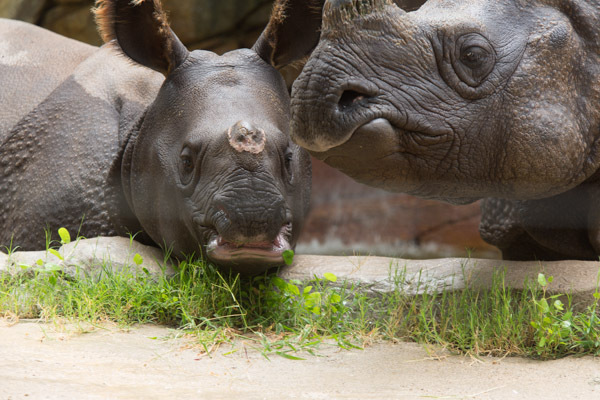 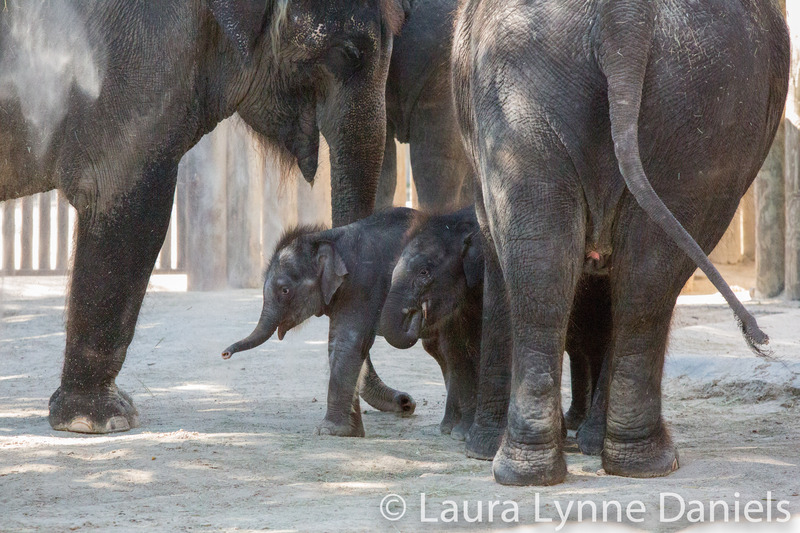 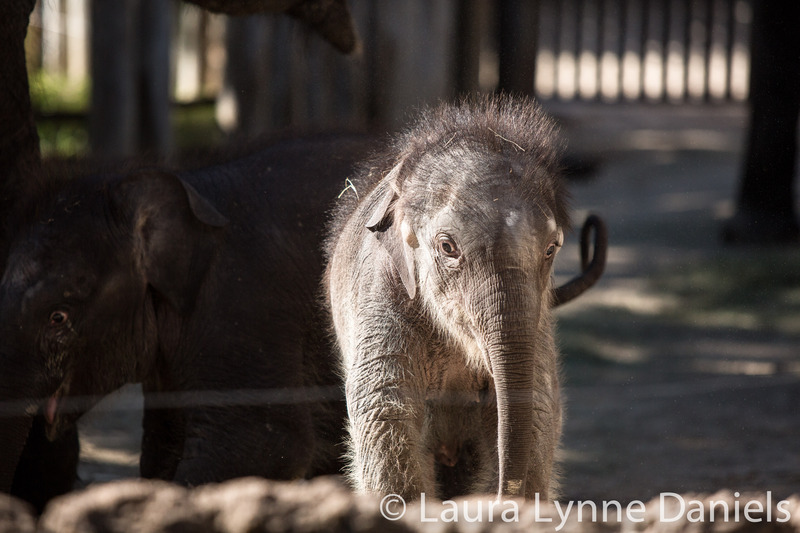 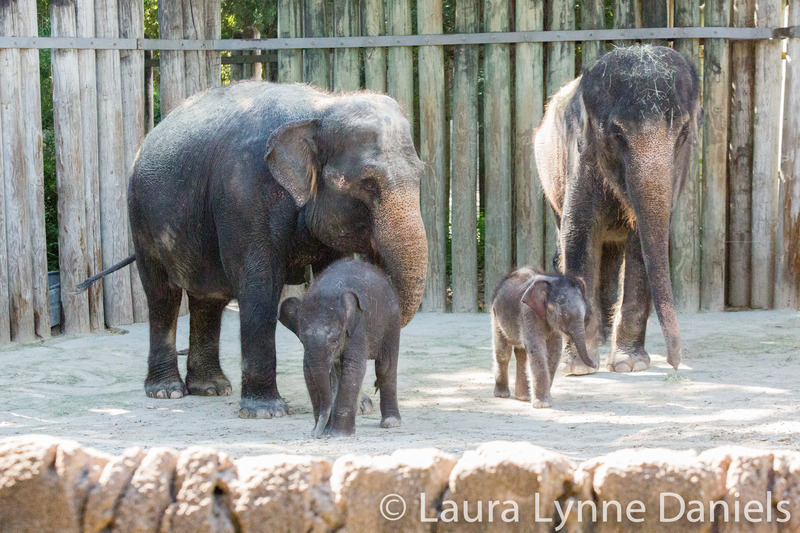 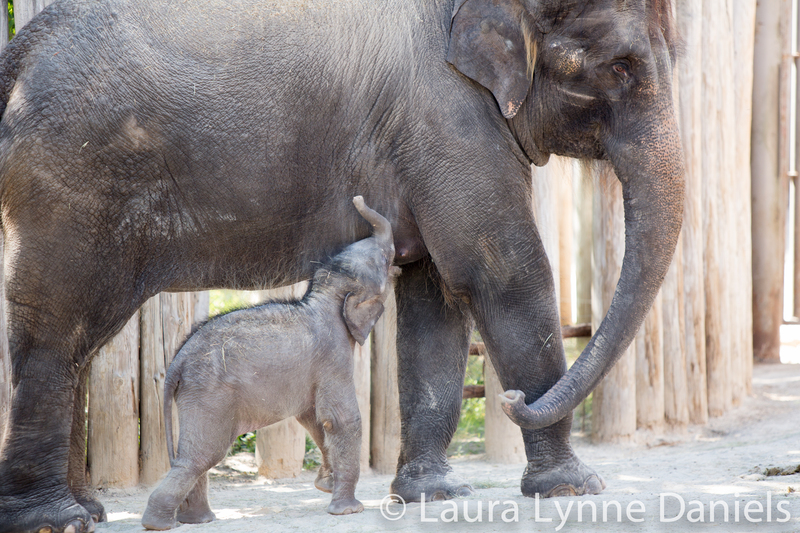 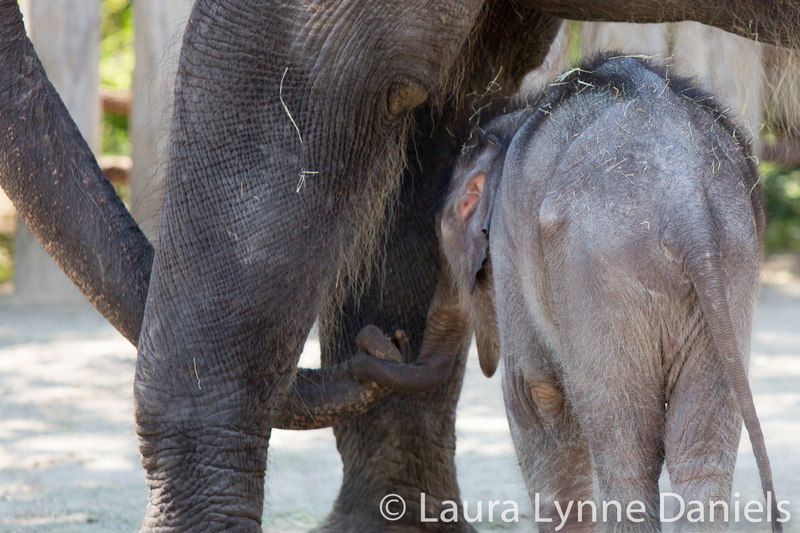 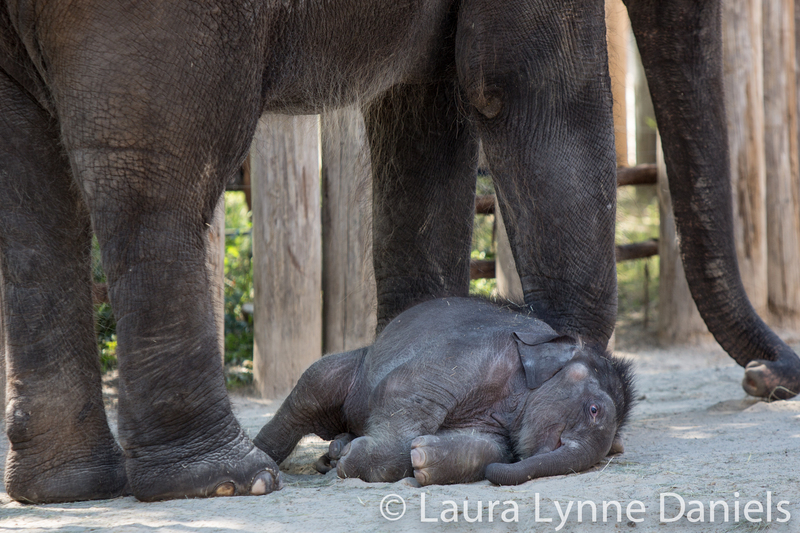 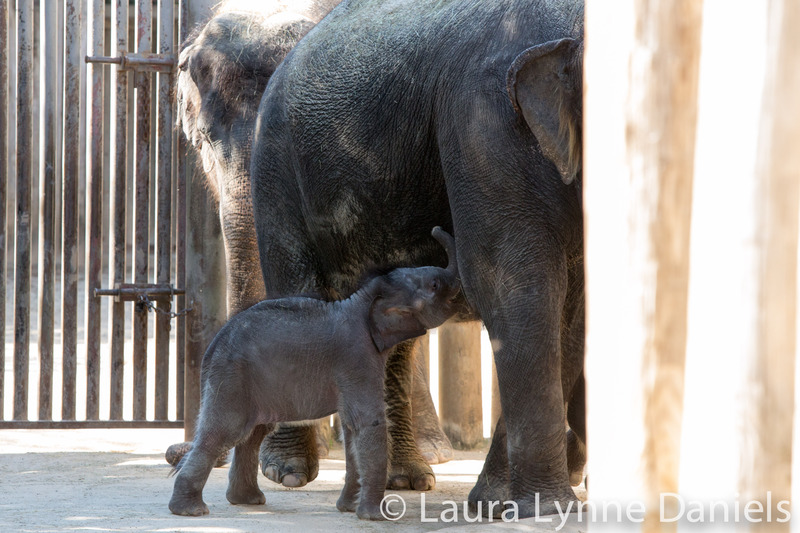 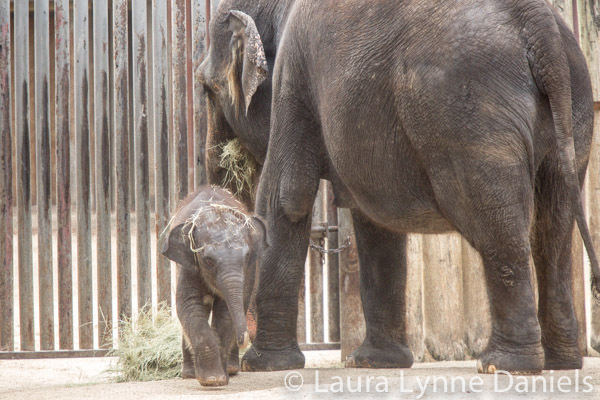 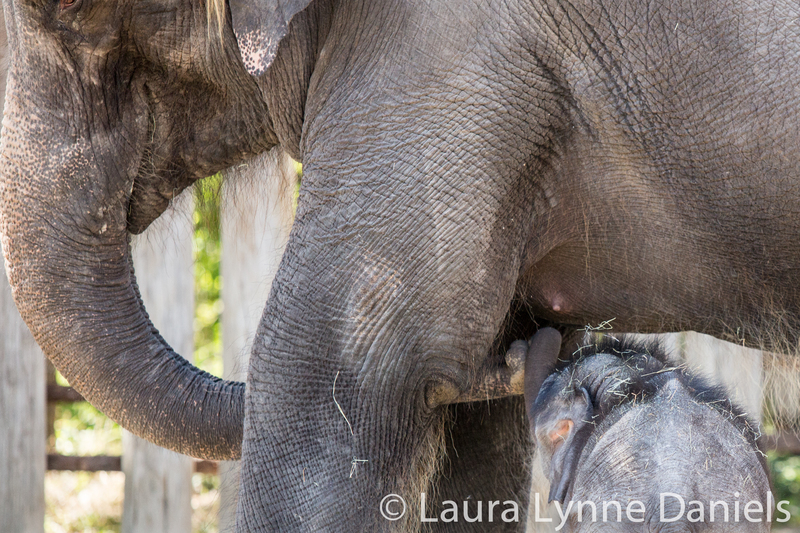 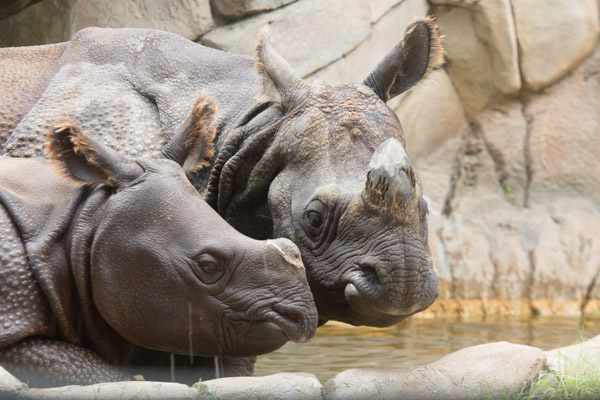 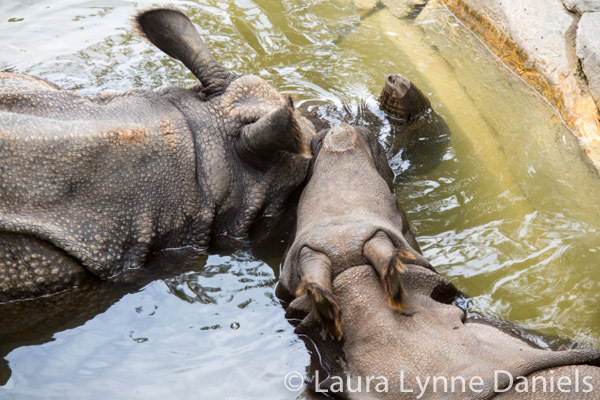 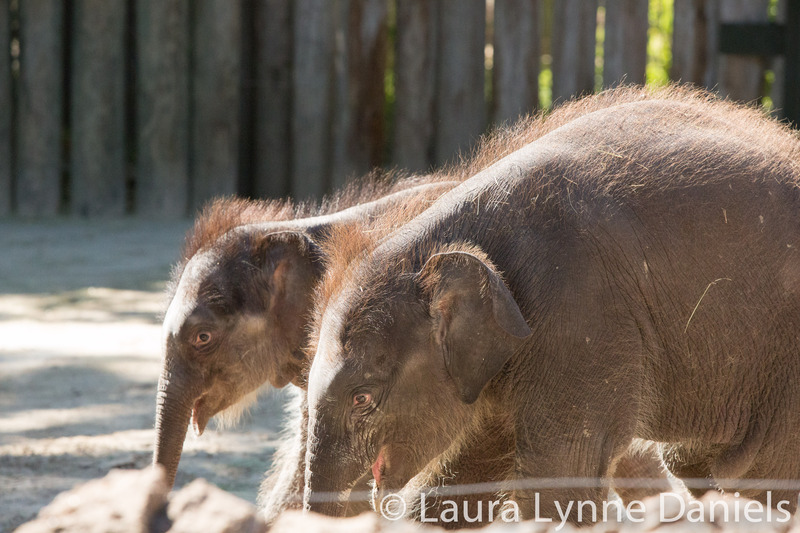 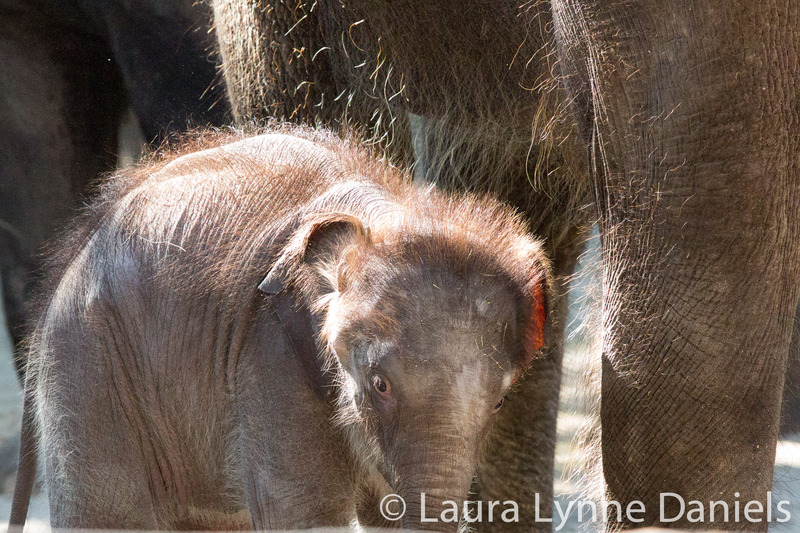 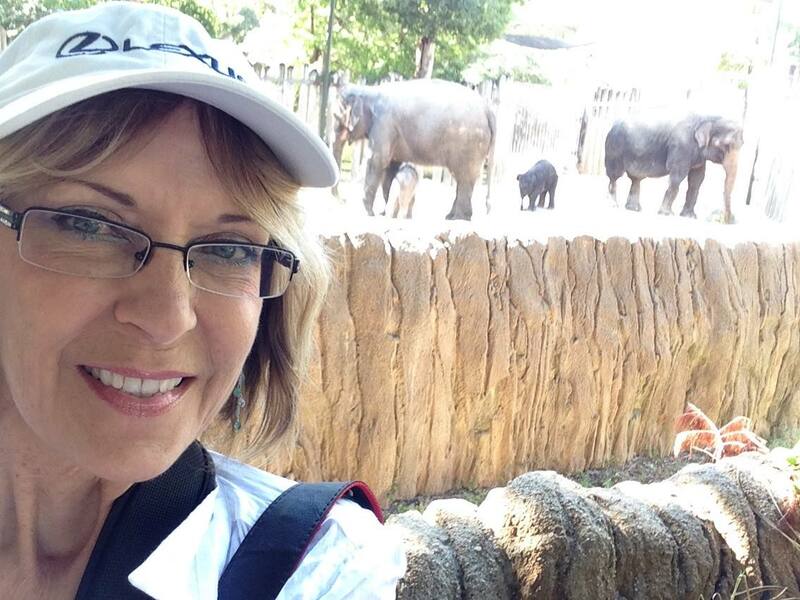 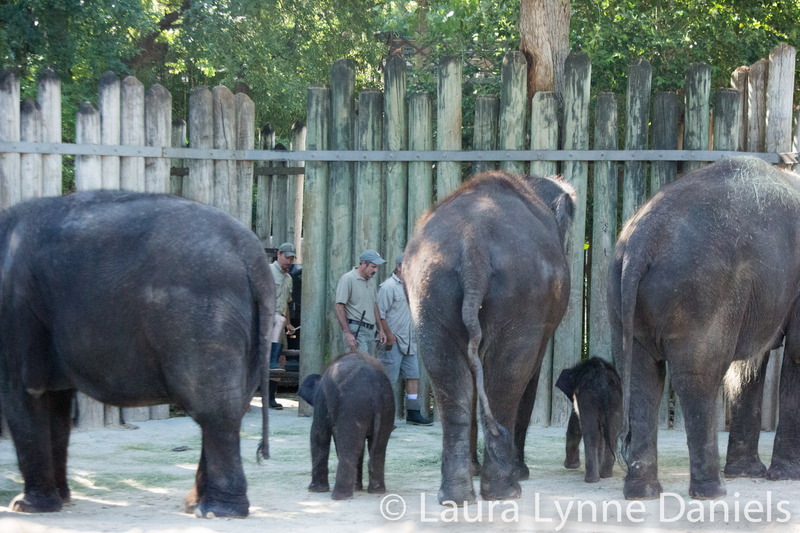 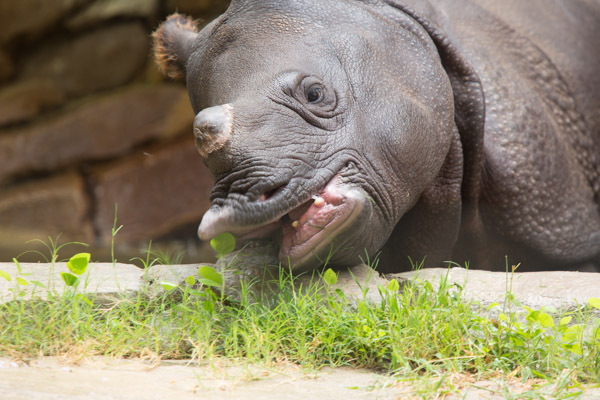 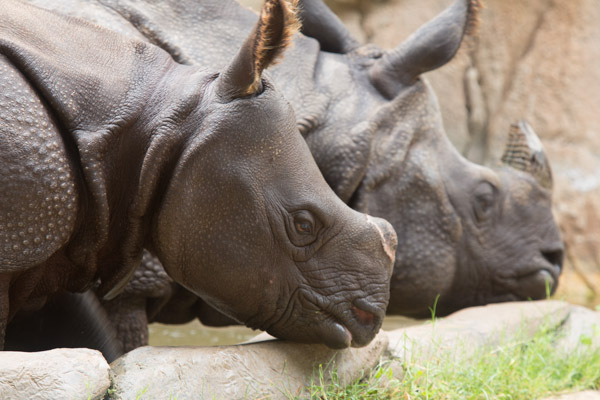 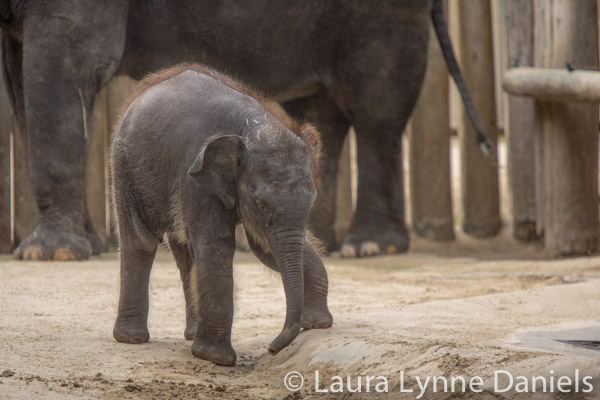 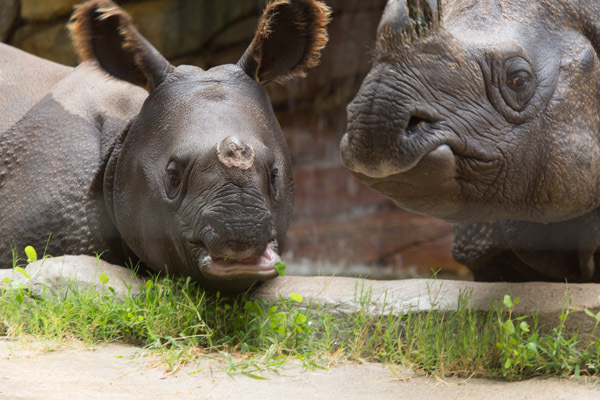 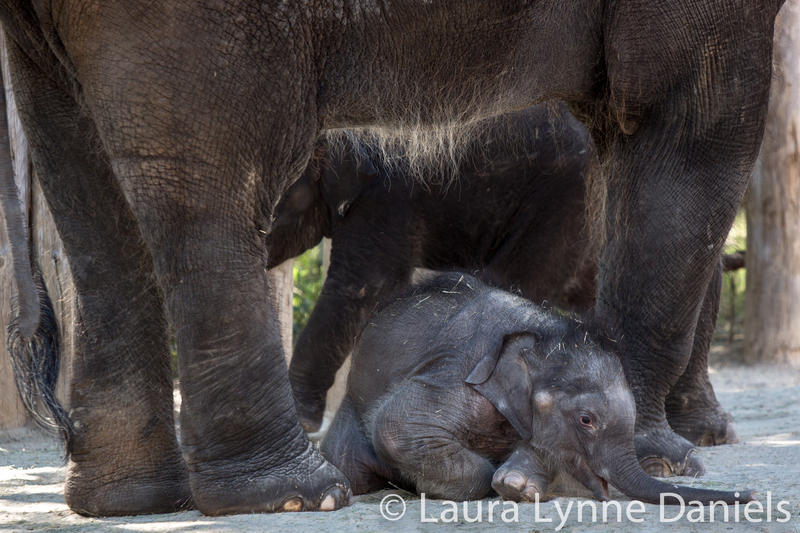 This is my blog about the Fort Worth Zoo babies. 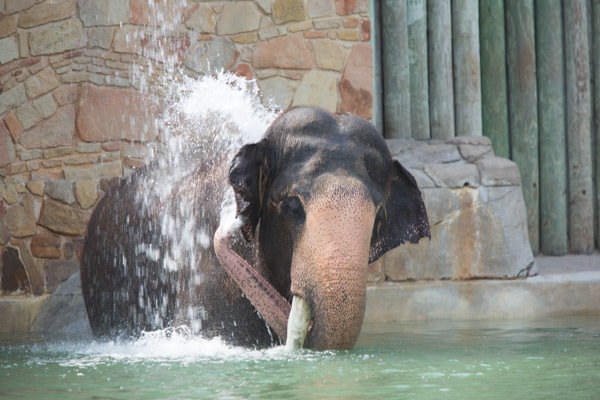 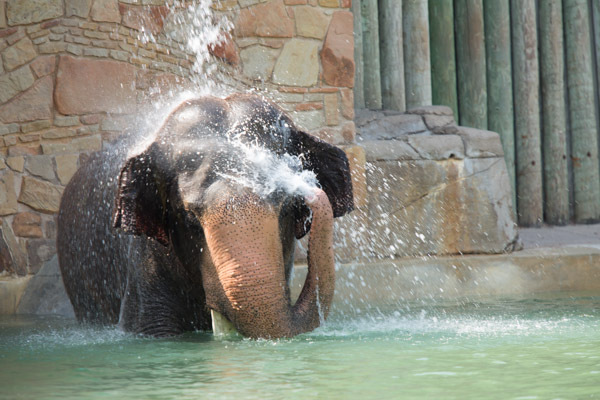 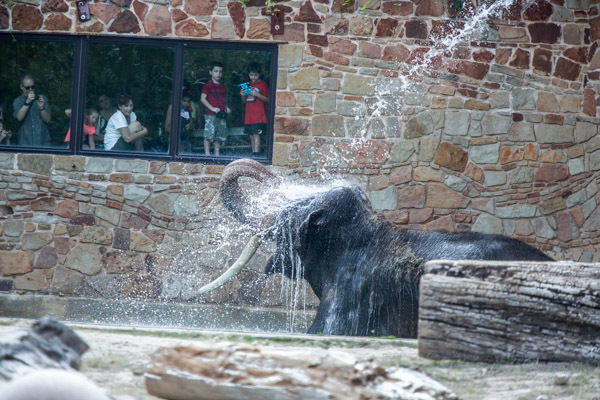 The Fort Worth Zoo is one of the best attractions in Fort Worth, and one of the best zoos I have ever been to. 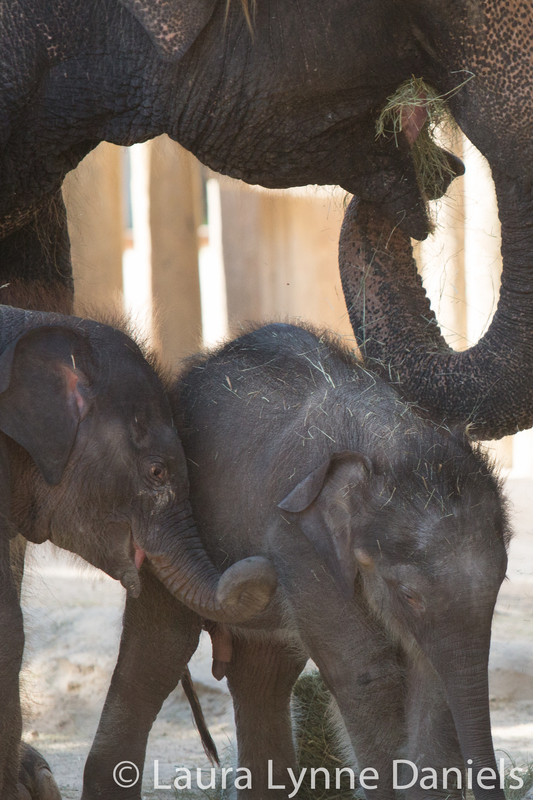 In the past two years there has been 3 new very big babies born. 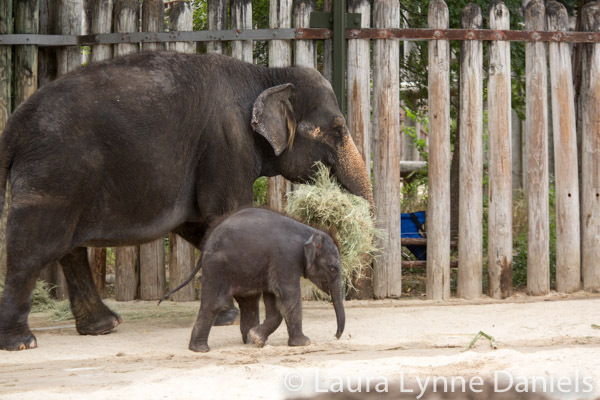 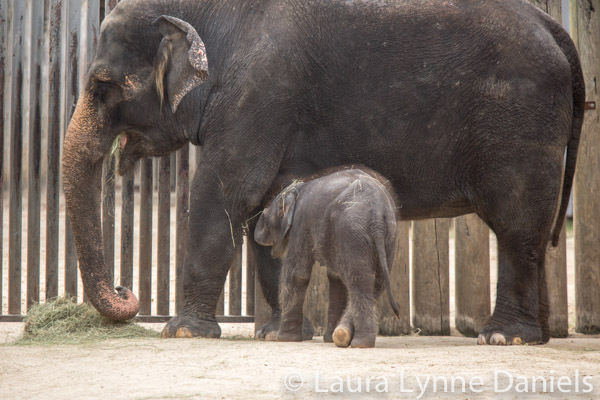 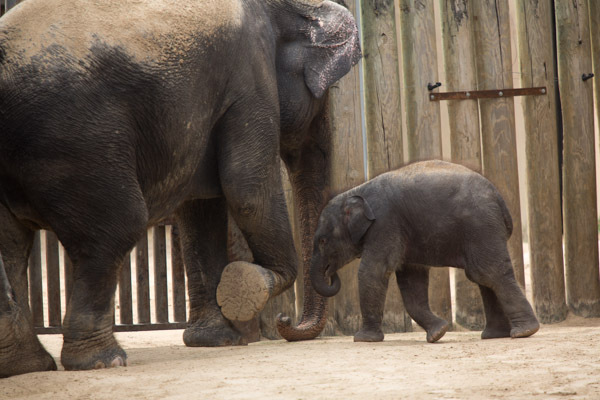 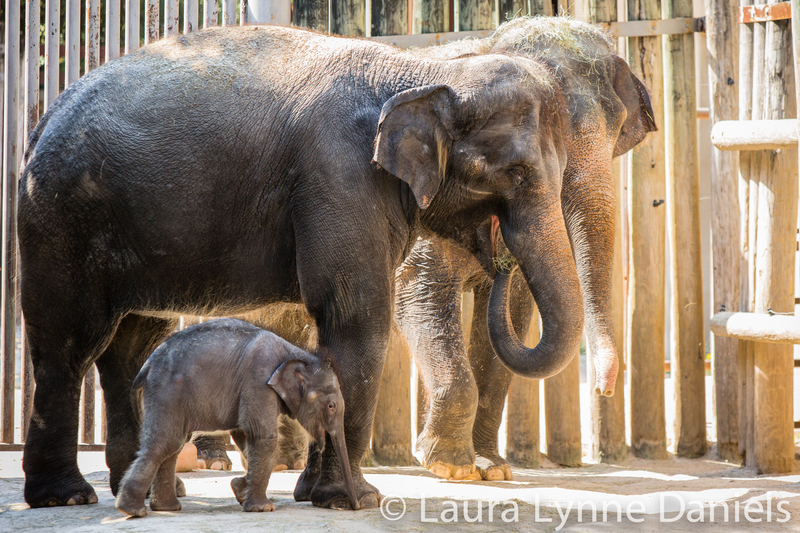 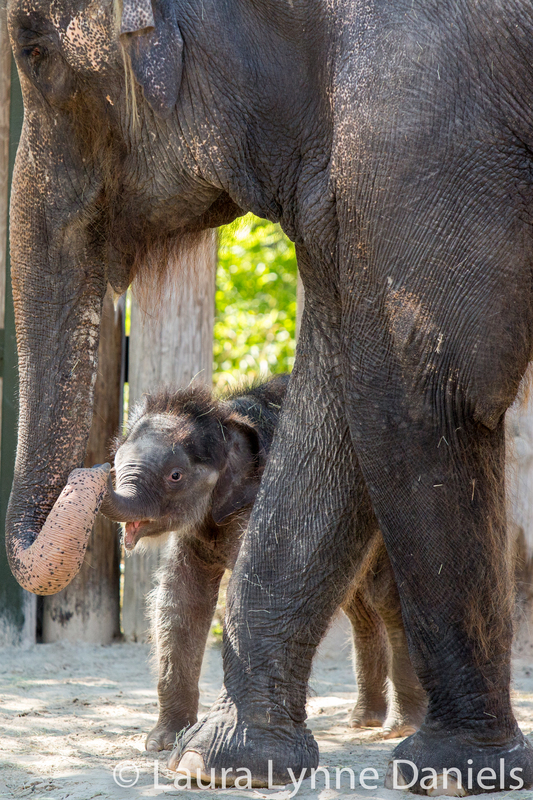 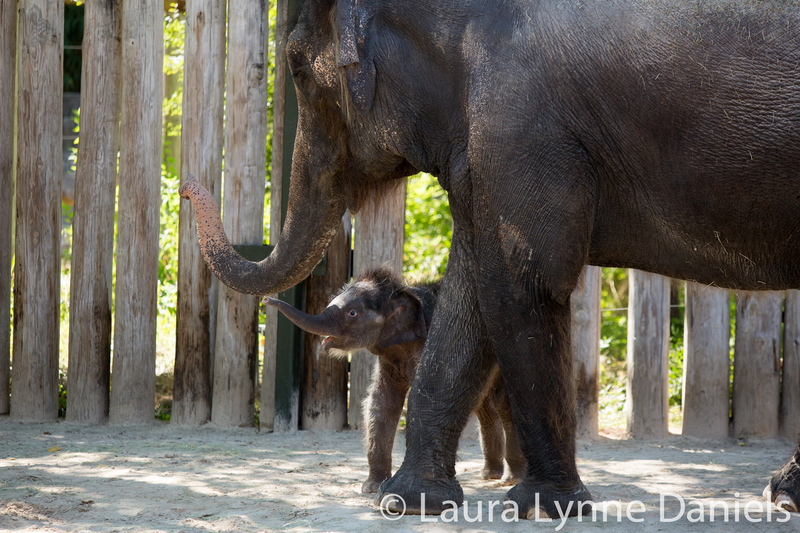 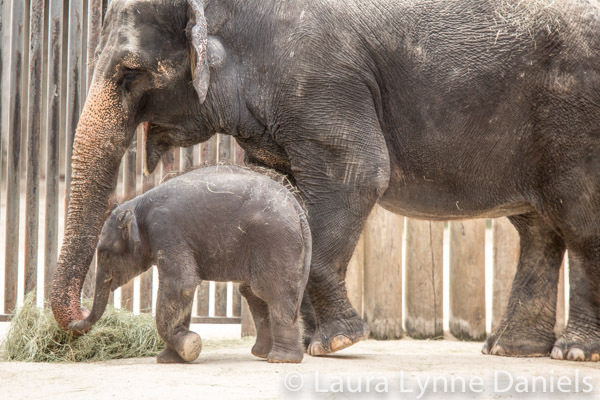 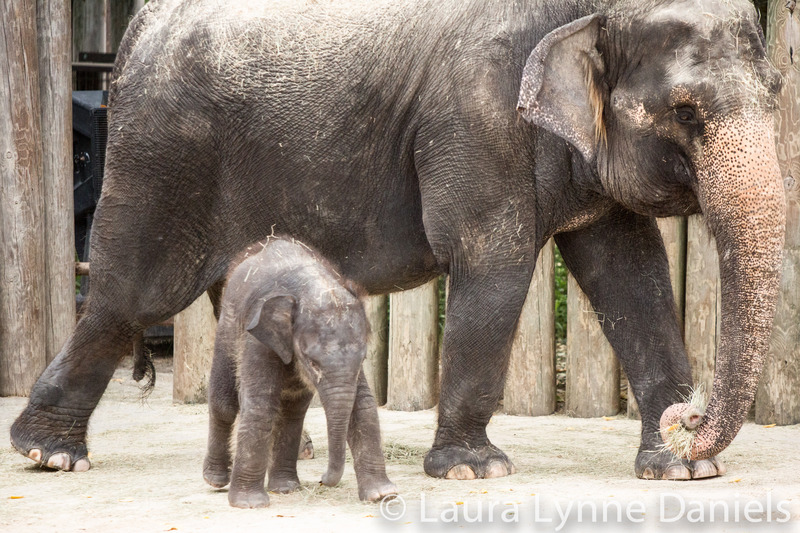 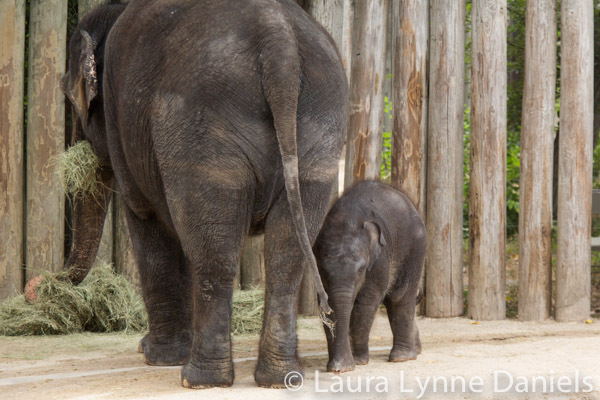 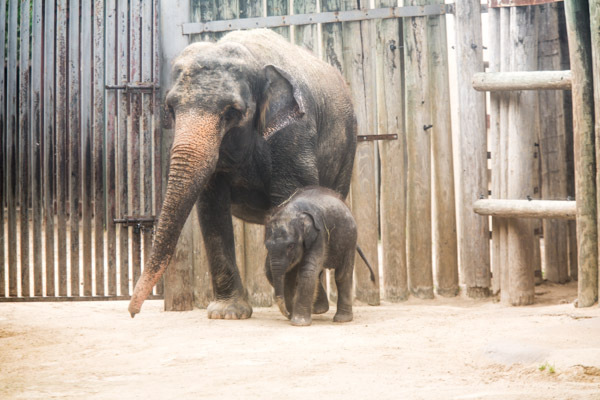 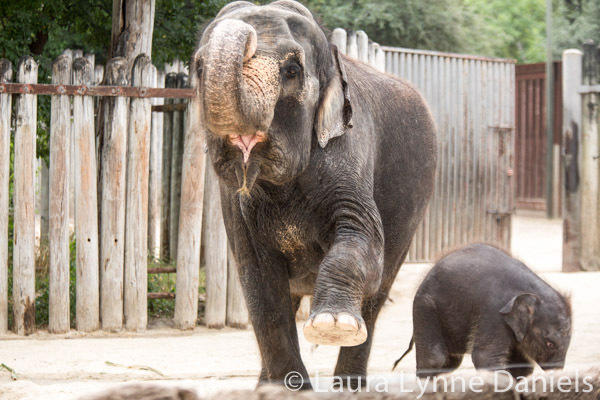 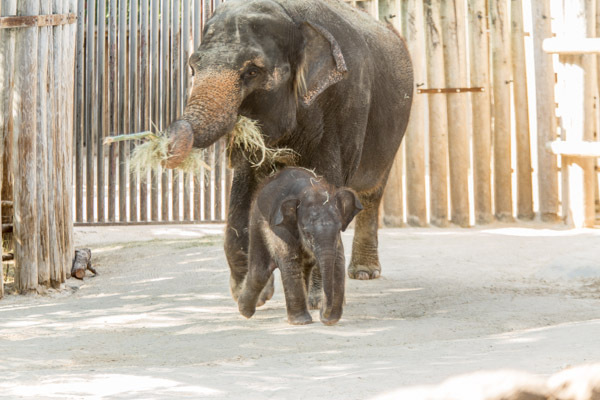 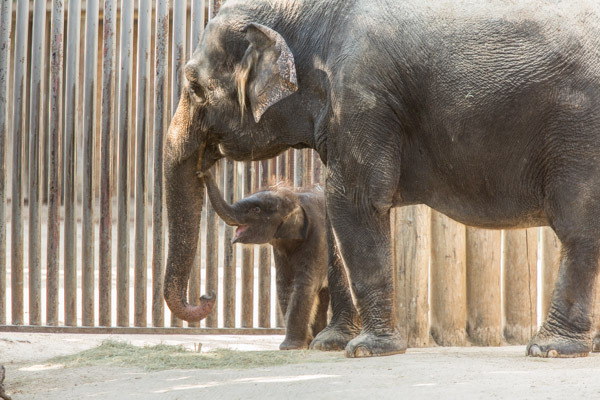 There was Asha, the One-Horned Rhino who was born in August of 2012, and now, in the summer of 2013, there were two brand new baby Asian Elephant’s born! 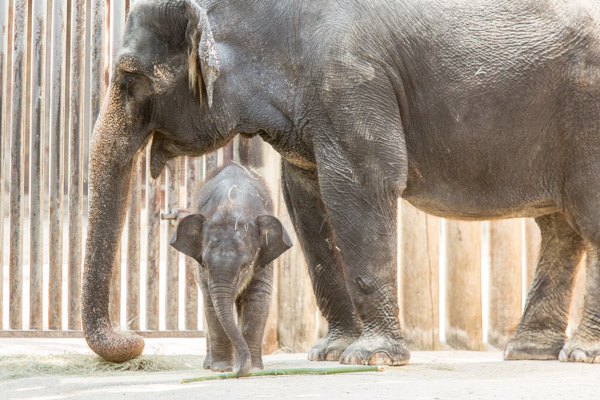 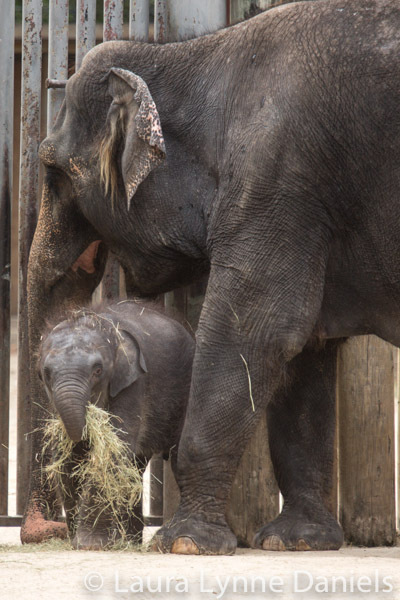 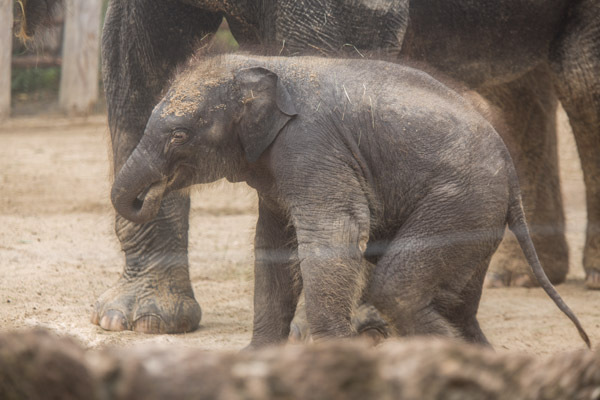 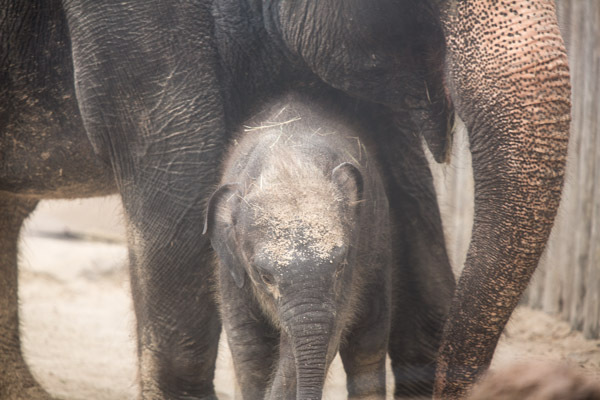 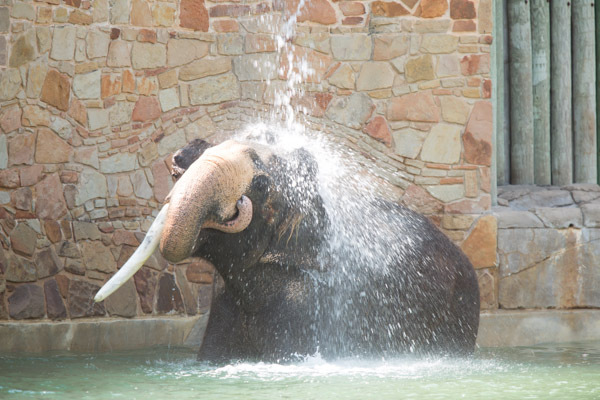 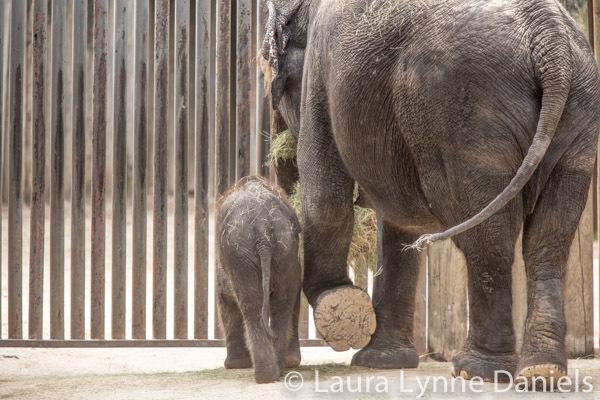 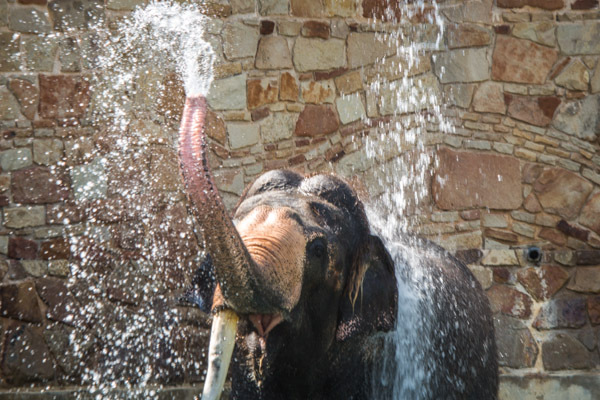 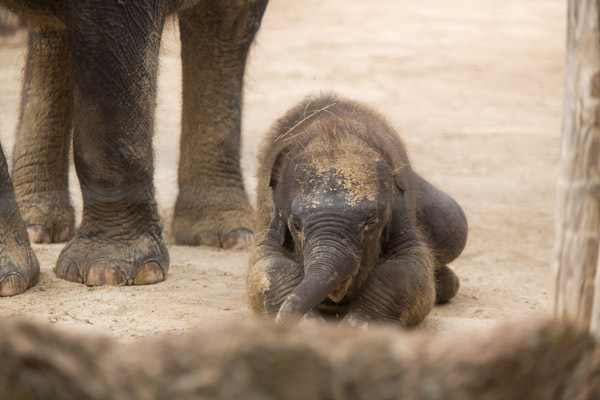 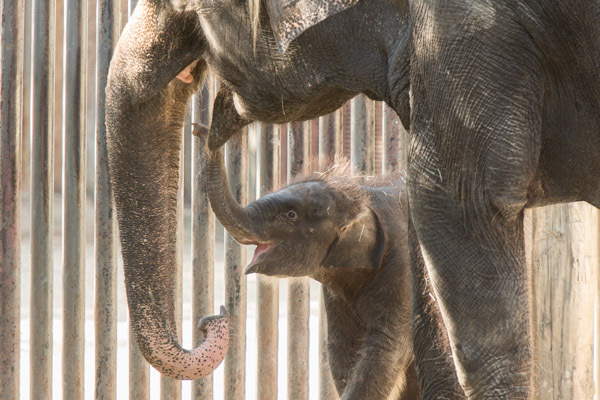 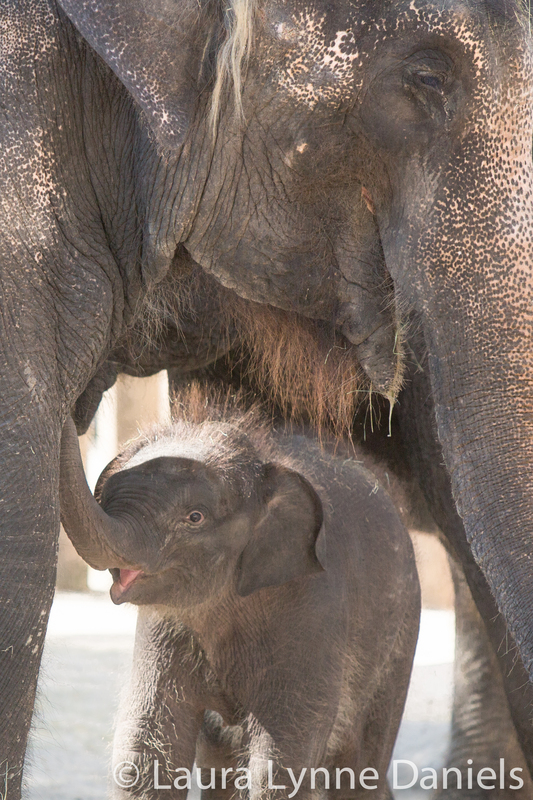 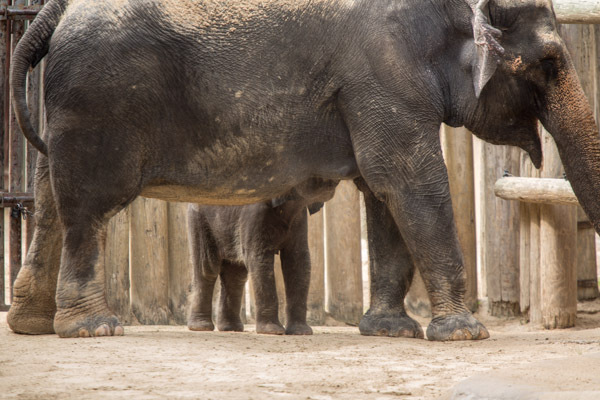 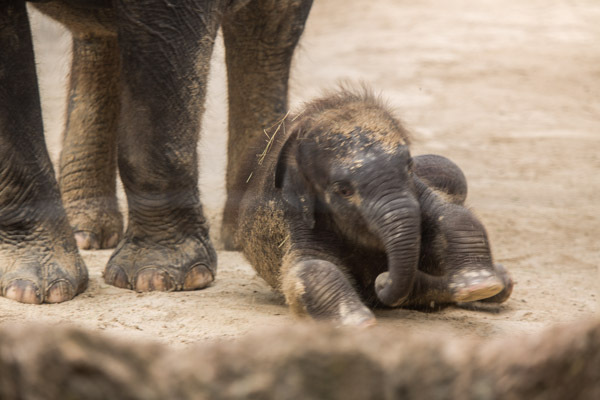 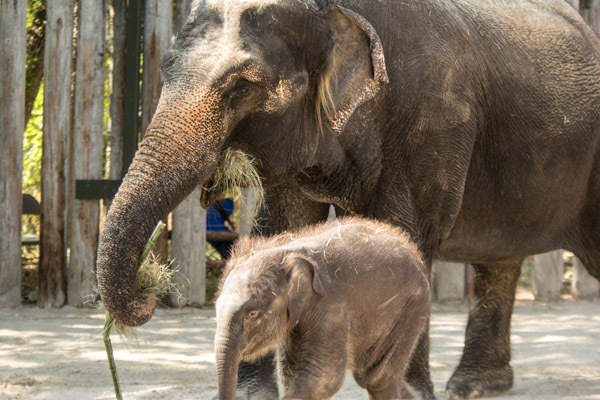 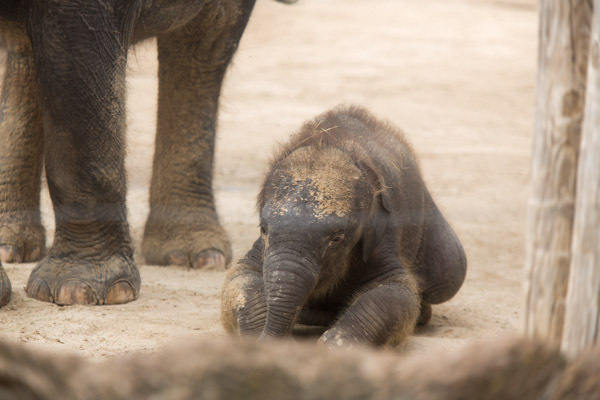 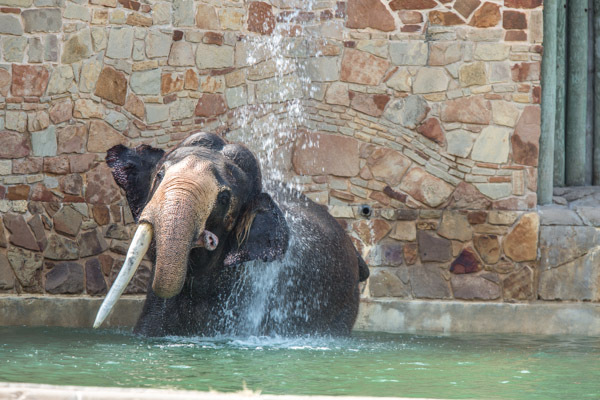 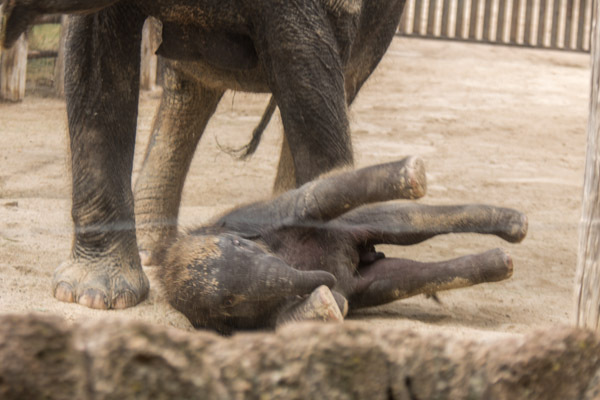 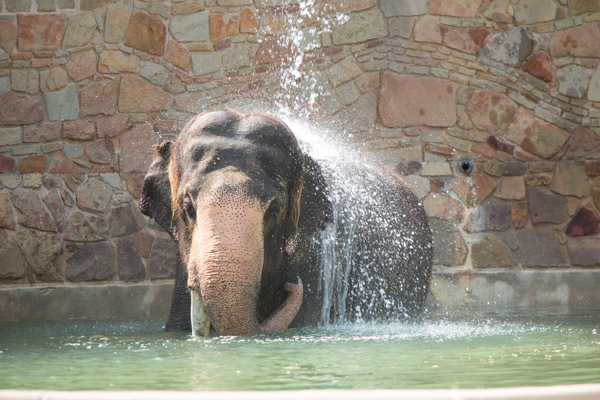 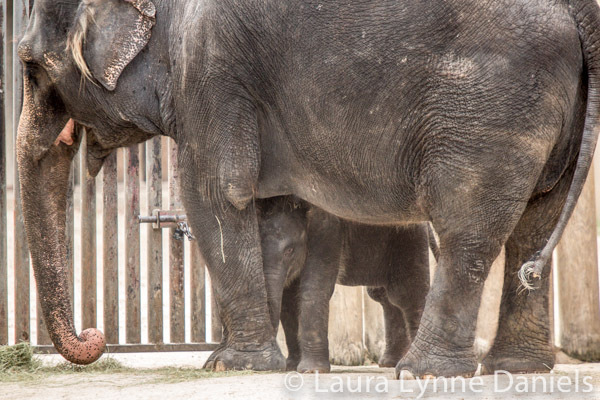 They were both born of different moms, but they are all related and now there are 3 generations in the elephant’s families at the Fort Worth Zoo, which actually mimics how they live in the wild. 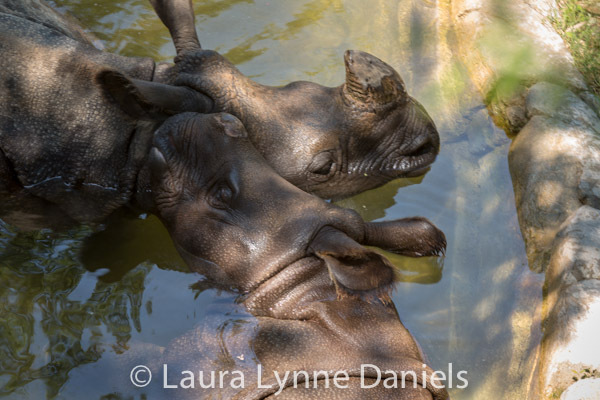 I am going to visit the babies and record their progress and growth with photos and writings in this blog. 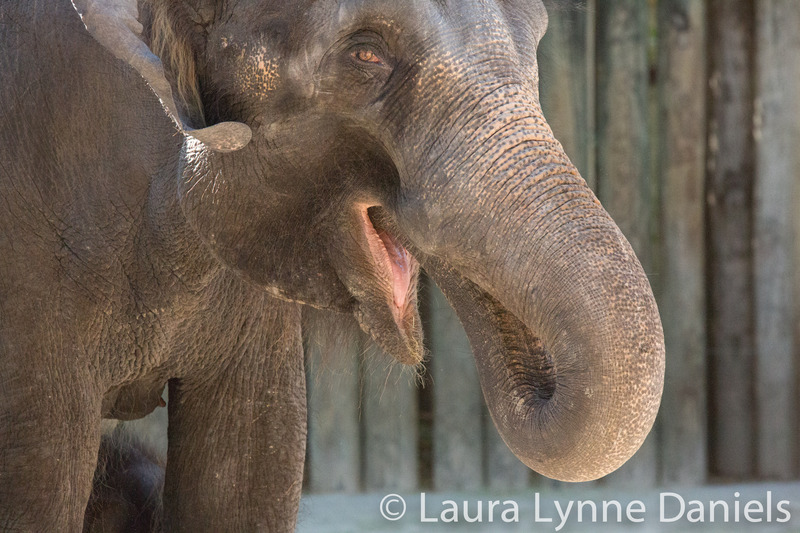 I am not an expert on animals or their behavior, but I am learning so much about them along the way. 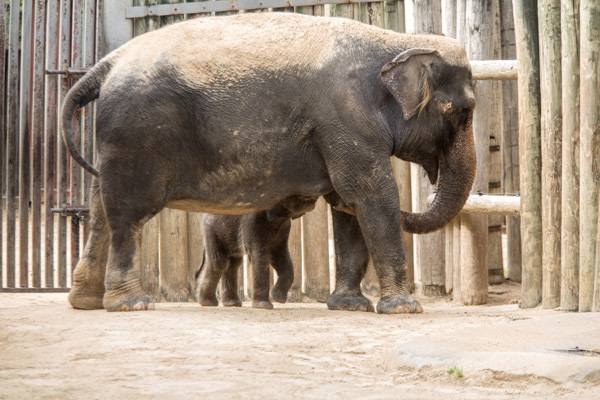 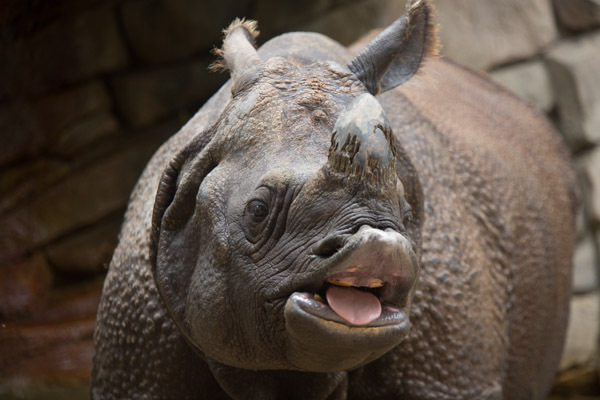 What I write here, is about my experiences at the zoo, I hope that much of it is fact based, I am passing along information that I learn each day about the different animals from the people who work at the zoo, and sometimes from an internet search. 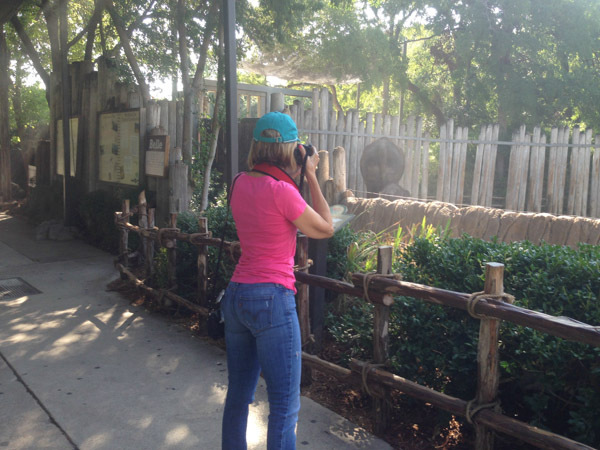 I am doing this because I love the animals and I love photographing them. 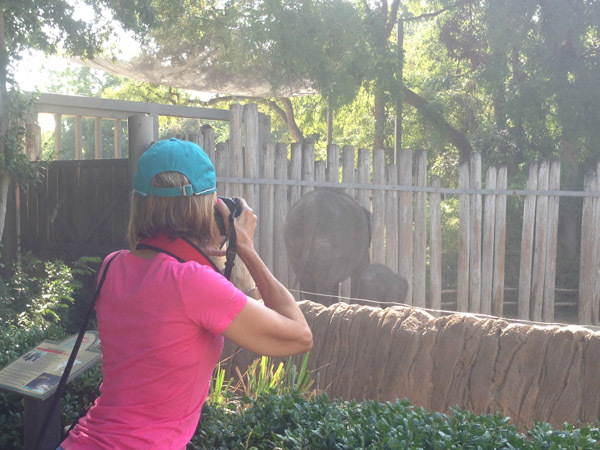 I am not a writer, I am a photographer, but along with the photos, I feel that I want to write everything that I learn and experience. 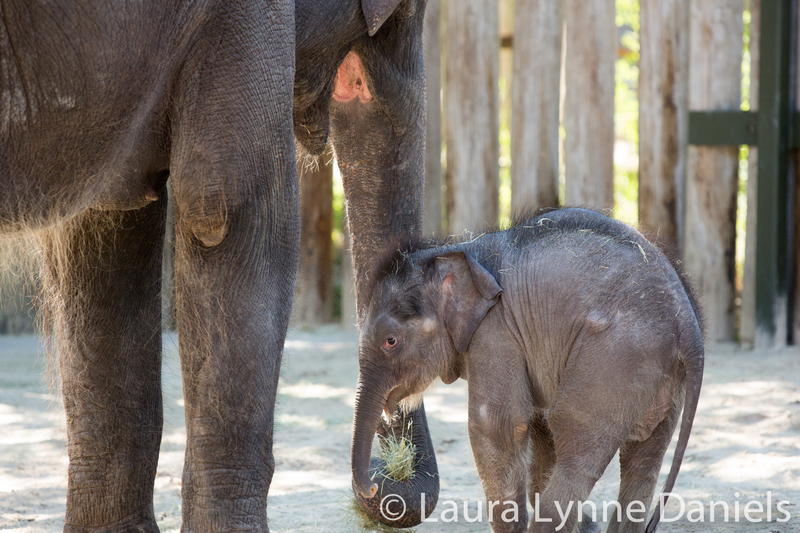 I have never written a blog before, so I am also learning about that. 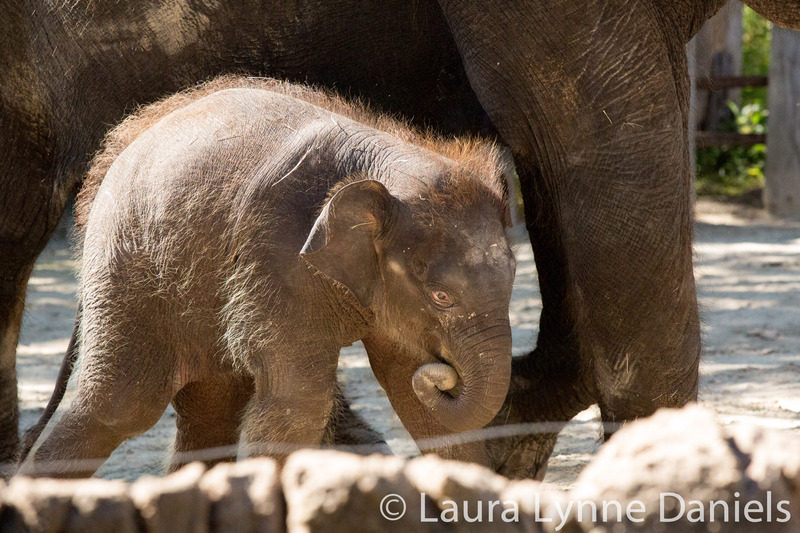 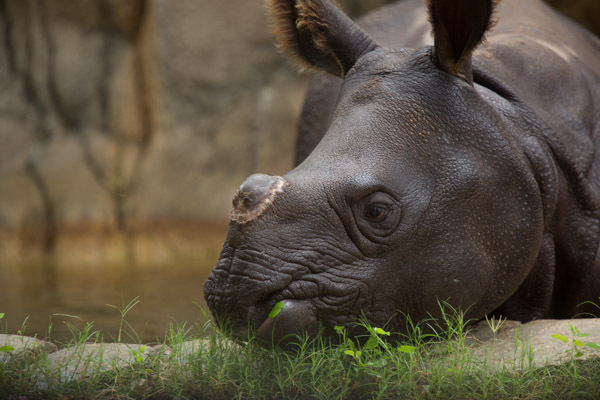 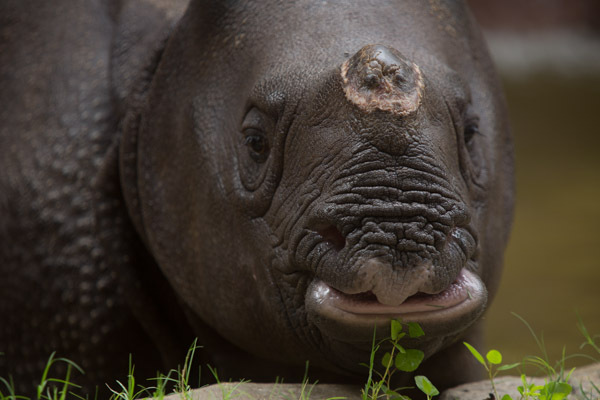 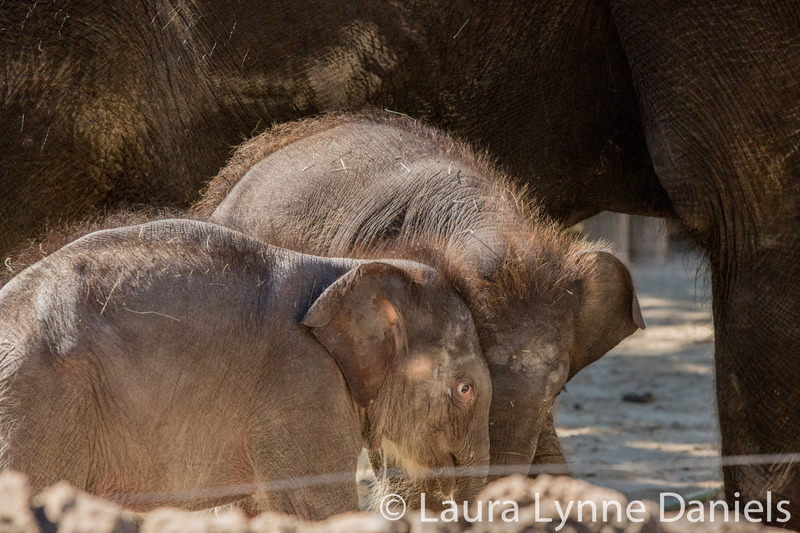 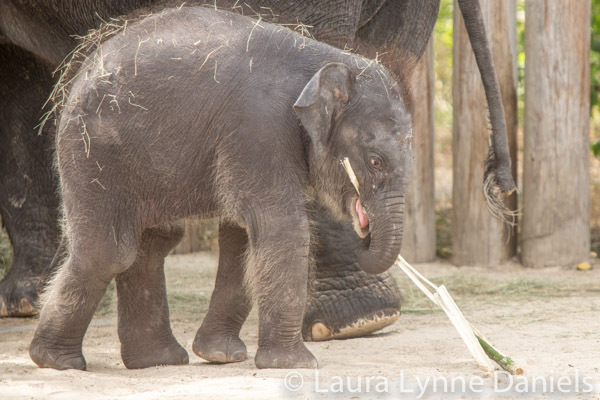 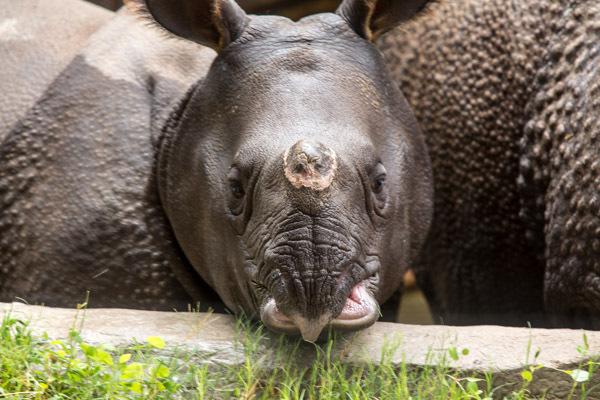 I will also post photos and notes about other animals in the zoo, but for now, I am concentrating on the elephant babies and the cutest little one-horned Rhino toddler. 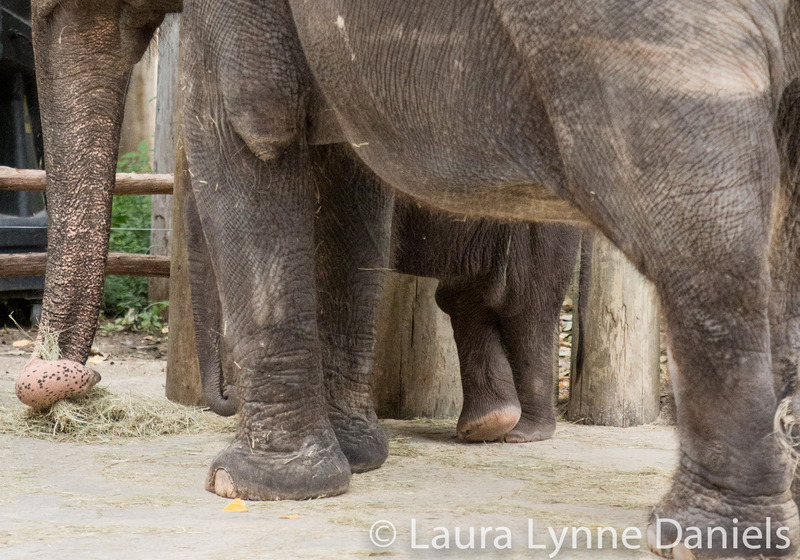 I hope you enjoy reading about my experiences here and viewing my photos as much as I do visiting, photographing and writing about them. 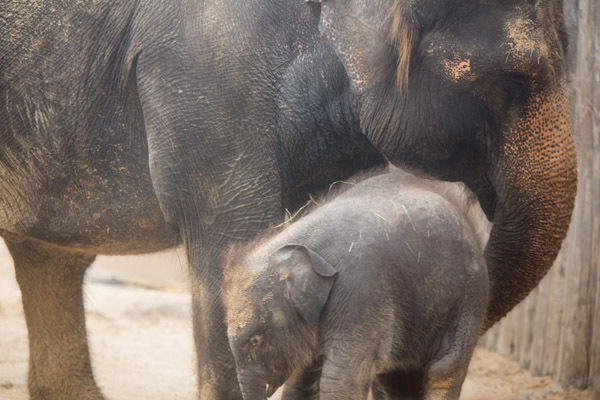 All photos are my property and are not to be copied or used without my permission and I thank you in advance for understanding that. 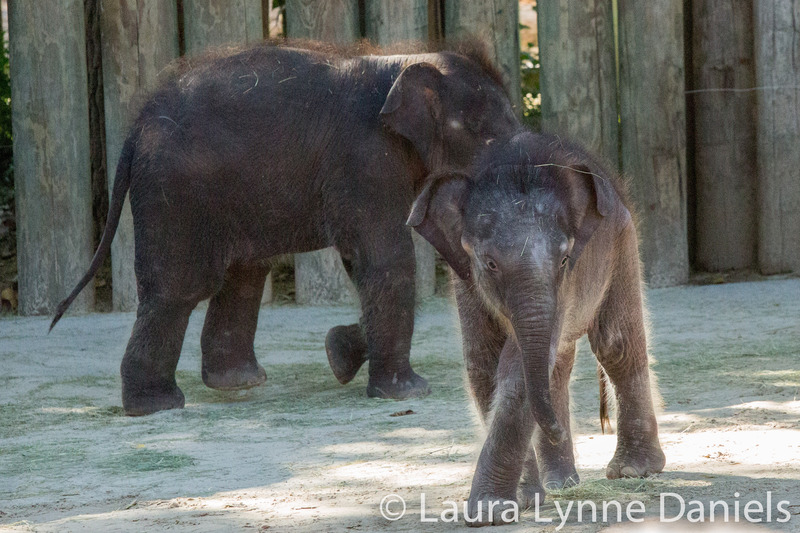 So, enjoy these babies along with me …..
After visiting with Belle and Rasha, I stopped by to see Asha and Shanti. 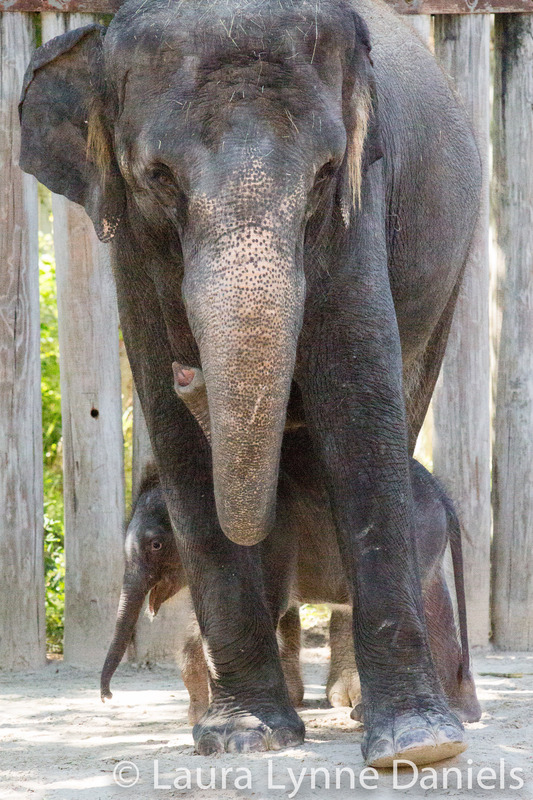 Asha is so snuggly and stays right by Mom, Shanti’s, side.